Palais Royale makes the ideal 1st day photo op. Going to Paris has always been a dream of mine. I always pictured it as magical as I had seen it in movies and TV shows so my I fantasized about how special it would be to actually travel there for the first time. Honestly, so many people had told me how magical Paris was that I thought that it couldn’t possibly live up to all the hype that had building over all these years. But you know what? It exceeded every hyped expectation I ever had. Plus, I got to experience it with my sister, Ariana, which made it even more special. Over the past two years, Ariana and I have been making it a point to travel together and we have been really making good on that promise. 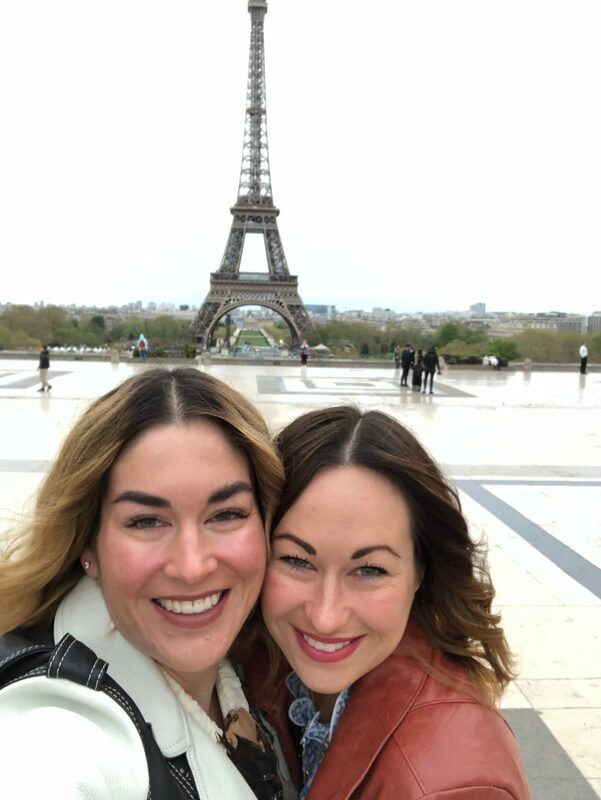 I have to say, Paris is probably the most epic Sister Trip we have taken yet so I wanted to write a blog post to not only commemorate our trip but also, a lot of you asked for me to break down our special Paris Sister Trip. I knew it was a good sign that we were staying at Hotel Saint Marc when they sent a private car to retrieve us from the airport. 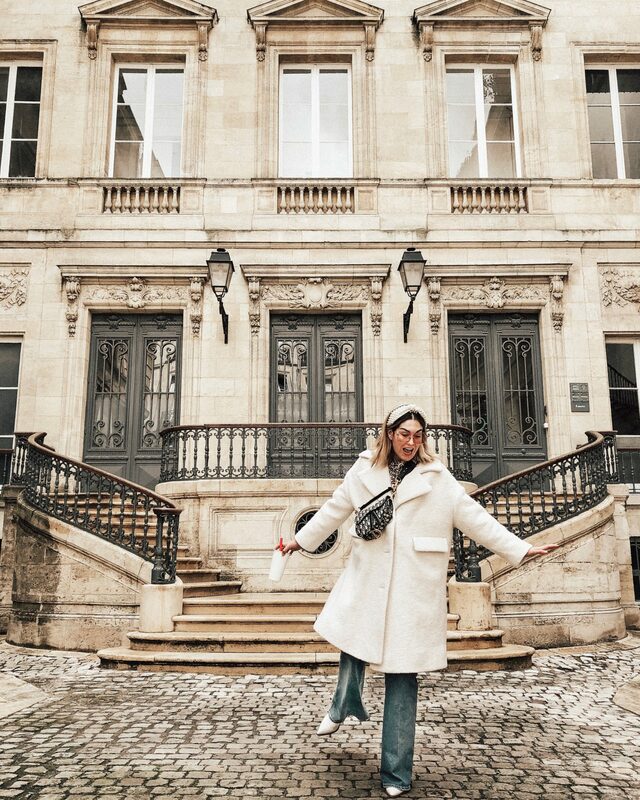 Ariana and I had done a ton of research on where we wanted to stay in Paris. 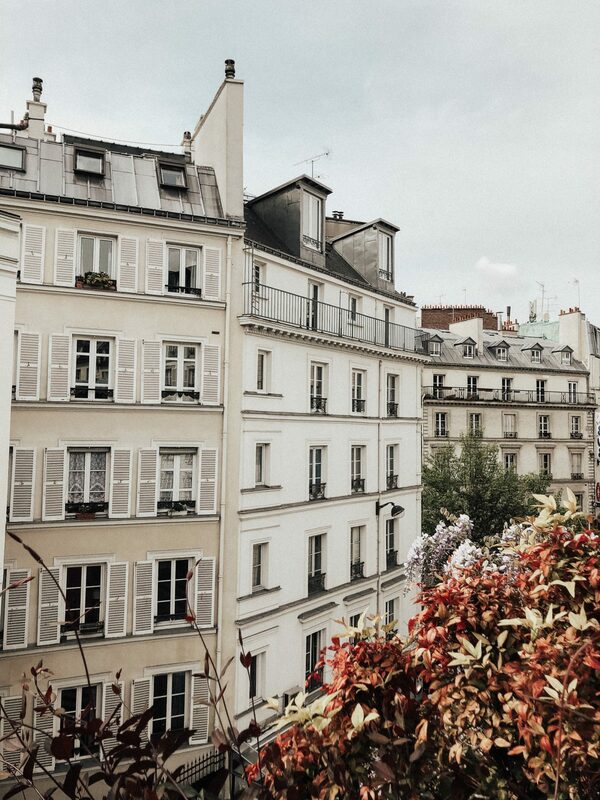 We looked at Airbnb’s and hotels and honestly, it seemed that Paris hotels were the way to go. Paris Airbnb’s tacked on a TON of fees onto the nightly cost, so we decided to go the hotel route, especially since at the end of the day, the prices seemed to even out tbh. 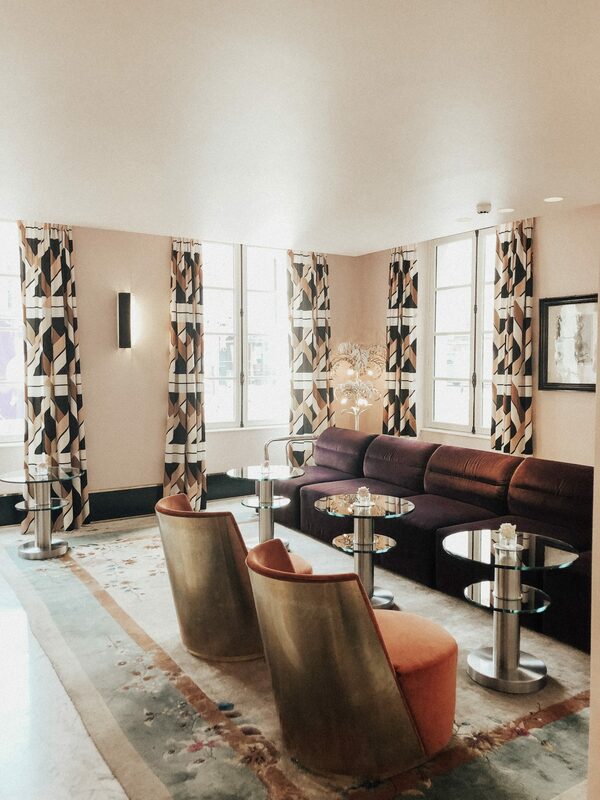 With Hotel Saint Marc, it was love at first sight. 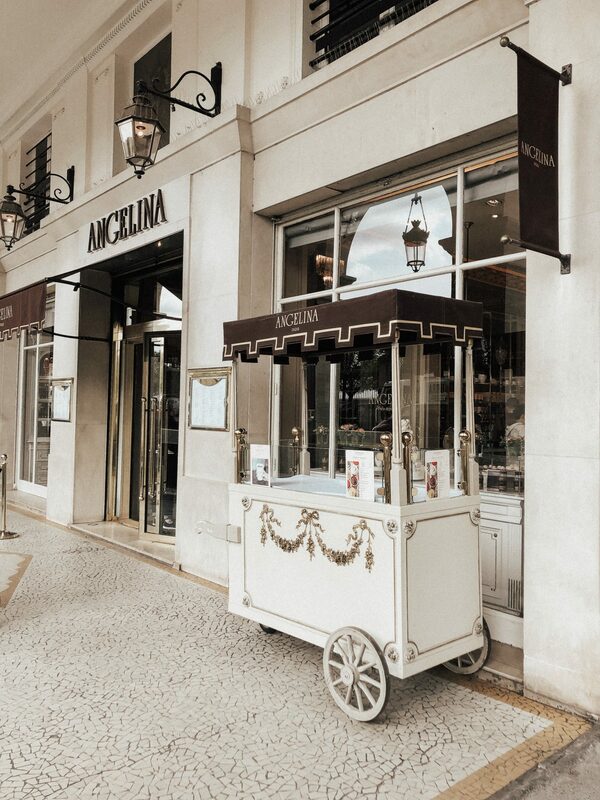 The entire hotel is curated to perfection, the staff was so kind and accommodating, and it’s in the best location. Even before we arrived, Hotel Saint Marc reached out to ask if we wanted a private car to pick us up from the airport. Um, YES?! 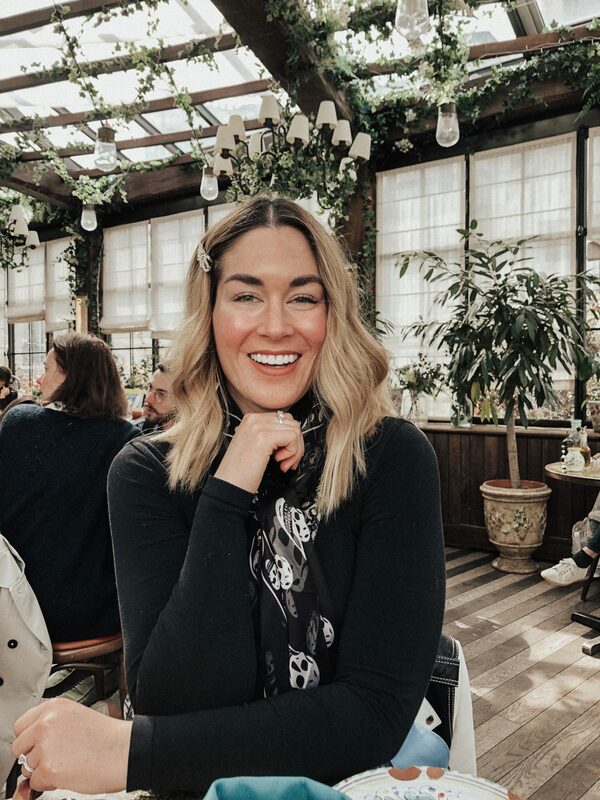 This was such an amazing perk because when you are in a new country, it can be overwhelming to get quickly acclimated to your new surroundings, especially when you haven’t slept at all and in you’re in a new time zone. Our driver was waiting for us right where he said he would be and just like that, we were off to our hotel! 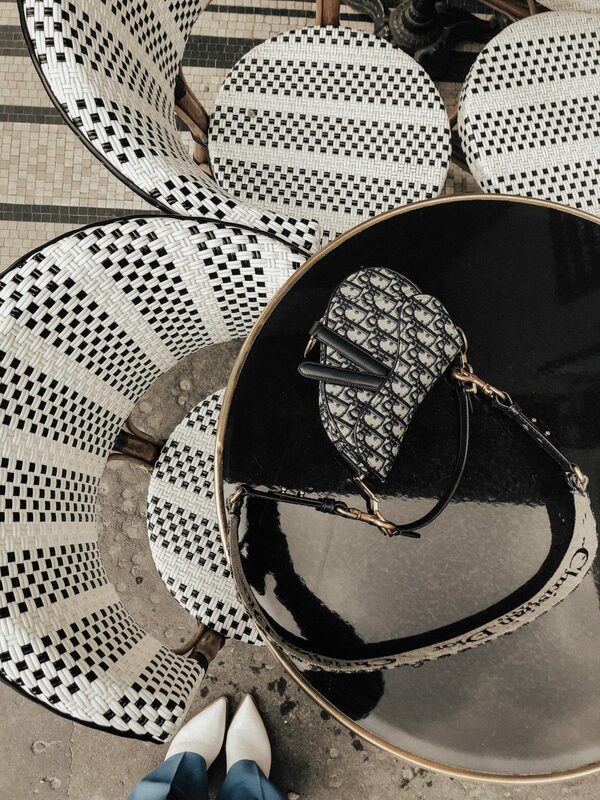 When we arrived at Hotel Saint Marc, we immediately sighed with relief. It was just as gorgeous as we thought it would be. We got in pretty early, around 10:30am and even though our room was not supposed to be ready until 2:00 pm, the staff was so great and got us into our room in about 20 minutes. Anyway, we got ourselves looking presentable (is there anything better than a hot shower after two super long flights?) and headed out to explore our neighborhood! The first thing that we discovered? The famous Palais Royale was literally on our hotel’s doorstep. We didn’t even care about how tired we were, we were walking the streets of PARIS. 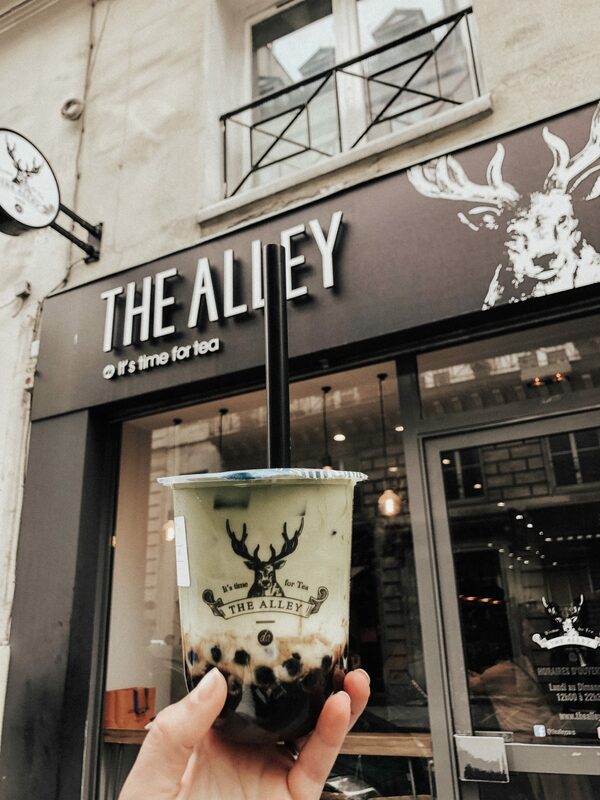 Before we left, one of my followers recommended an awesome Boba shop (The Alley Opera) that was literally 800 feet from our hotel so we stopped off to get a matcha first and than headed to Palais Royale. 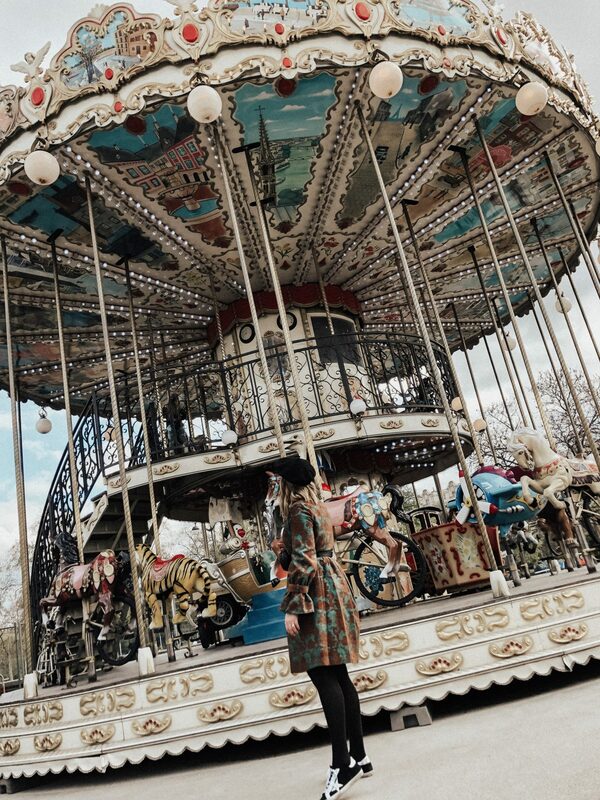 Because Ariana and I got to Paris right before the start of the busy spring/summer season, Paris was not packed at all. In fact, it seemed pretty empty. 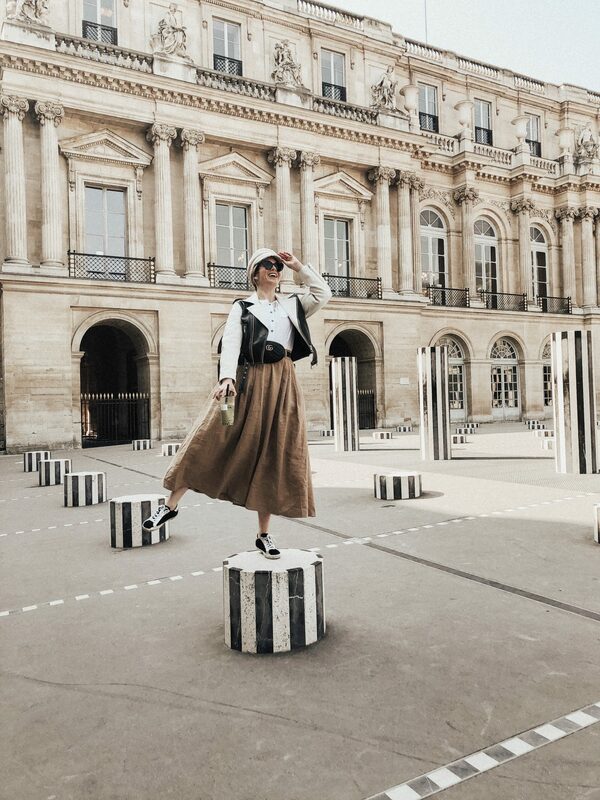 When we were done with the Insta famous black and white art column at Palais Royale, we walked a little ways down the road and walked right by the Louvre. It was stunning and honestly shocking to see it IRL. For this trip, Ariana and I decided not to go to the museum because we really wanted to focus on seeing Paris from a local’s perspective and I heard it’s actually a bit overrated and (obviously) touristy. First time I saw the Eiffel Tower! At this point, keep in mind that we haven’t slept in like 30 hours but we are trooping through and just enjoying the magic. We decided to walk to the Eiffel Tower because I just HAD to see it on our first day. It was about a 30 minute walk from the Louvre but it was nice just taking our time and really seeing everything was around us. When I first saw the Eiffel Tower, I couldn’t help but smile. 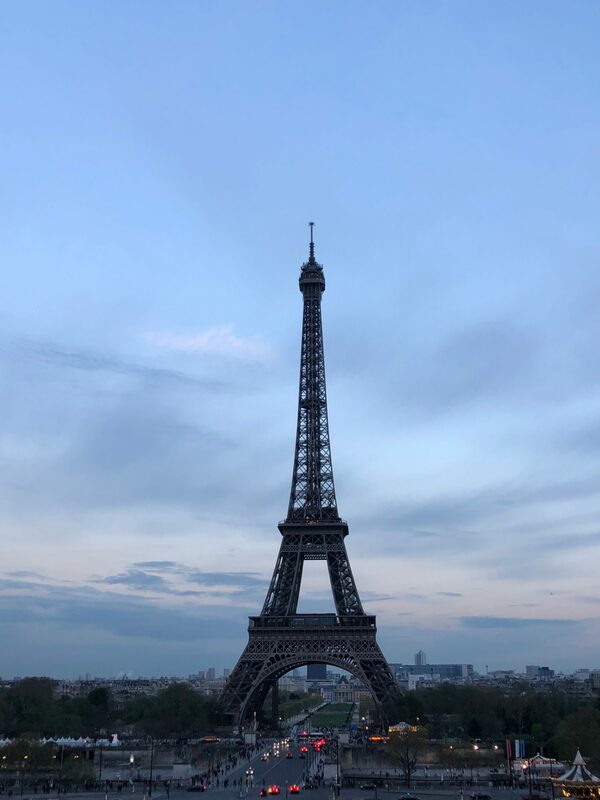 It truly is magical and just takes over all of your senses because it’s the true “WE ARE ACTUALLY IN PARIS” moment when you see this iron lady. How are even the metro stops SO CUTE in Paris? We were in such a time zone daze that I barely remember this meal. Even though we had a bunch of food places that we wanted to try, it was honestly overwhelming to be in a such a famous city with cute looking restaurants everywhere. I also think that I underestimated how big Paris actually is. It’s HUGE. We were averaging 10-14 miles a day just to see everything we wanted to see. So that first day was tough. It was 2:30 pm, we had not eaten anything and lunch places seem to close around 2:30 in Paris and then reopen again later in the evening for dinner. We finally just found a place (I don’t even remember what it’s called) and sat down and ate Croque Madame. The place was fine, not incredible by any means, but we were just happy to be eating. 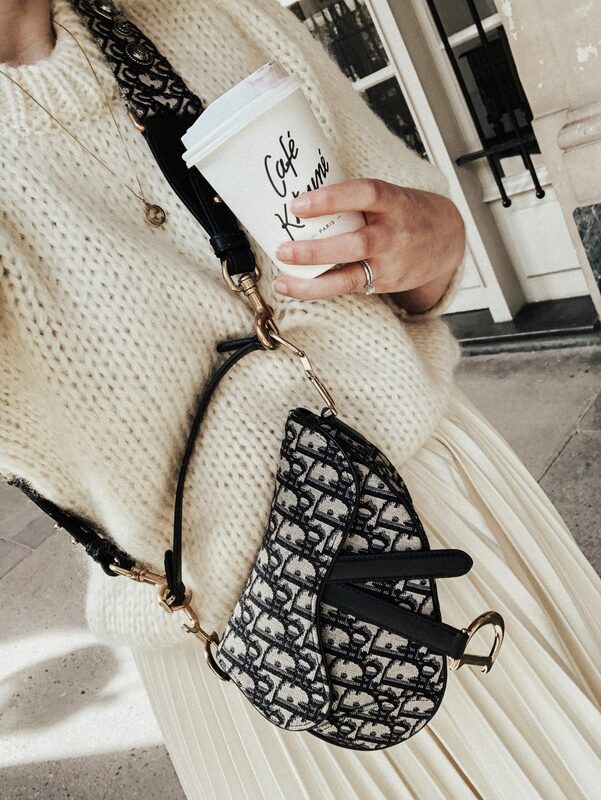 When we finished, we walked to buy my special Paris Dior bag that I had been waiting to buy until this trip. It ended up being kind of crazy because they had ONE strap left to go with the mini saddle bag that I wanted but I got it and could not be happier. I literally wore it for the entire rest of the trip and love it so much. After that, we walked back to our hotel and called it an early night because we were exhausted and needed to sleep. 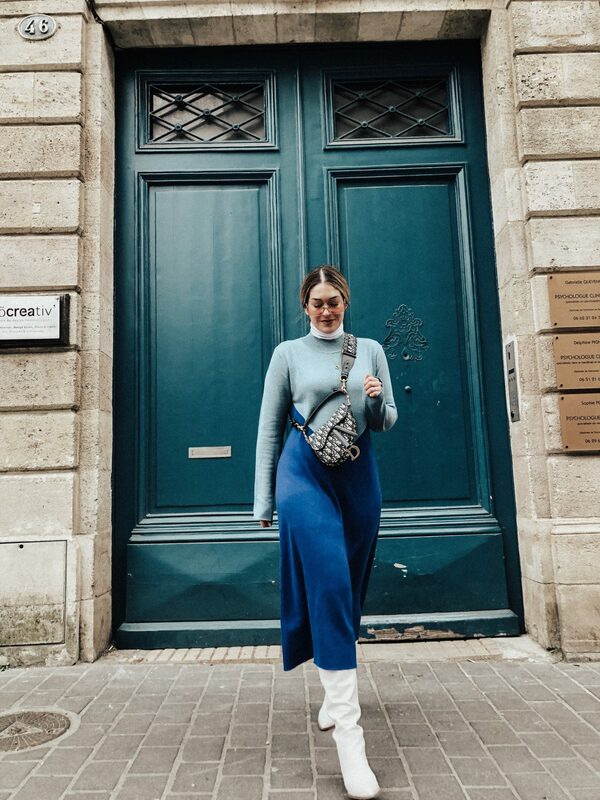 I wanted all of my Paris outfits to be effortless and easy because I knew we would be walking a ton. We slept from 8:30pm-10:30 am because damn, we were awake for like 35 hours straight and we felt so rested when we woke up and ready to take on the day as Parisians! 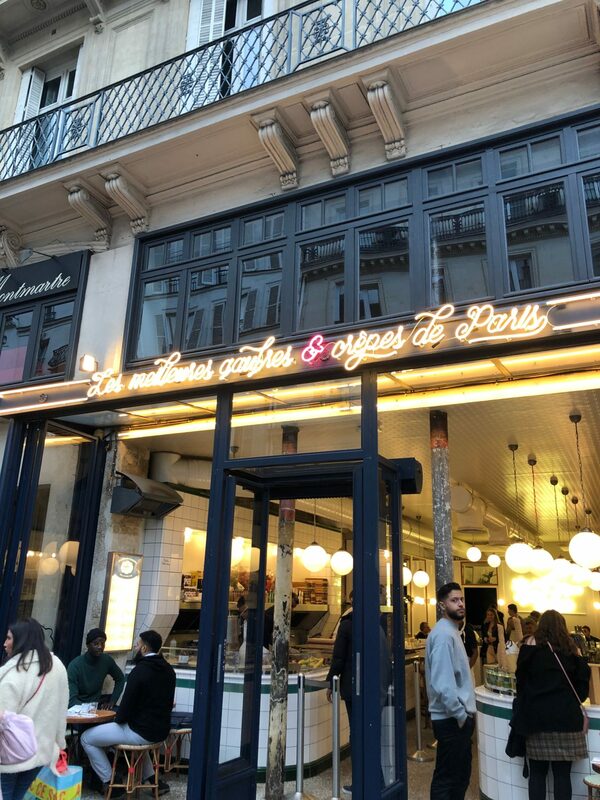 We wanted to eat at a place that Ariana found that was located in the Le Marais district, which is actually the LGBTQ friendly neighborhood in Paris. In true Miller fashion, we decided to walk there (it was about 1.5 miles from our hotel) but it felt amazing to be walking around taking in the sights on our way. We weren’t really sure what kind of weather we were going to have on our trip since spring can be unexpected but this day was pretty warm so I was fine with a heavy sweater. We ate at Paperboy, which was amazing, because they make breakfast and lunch sandwiches with all fresh ingredients. 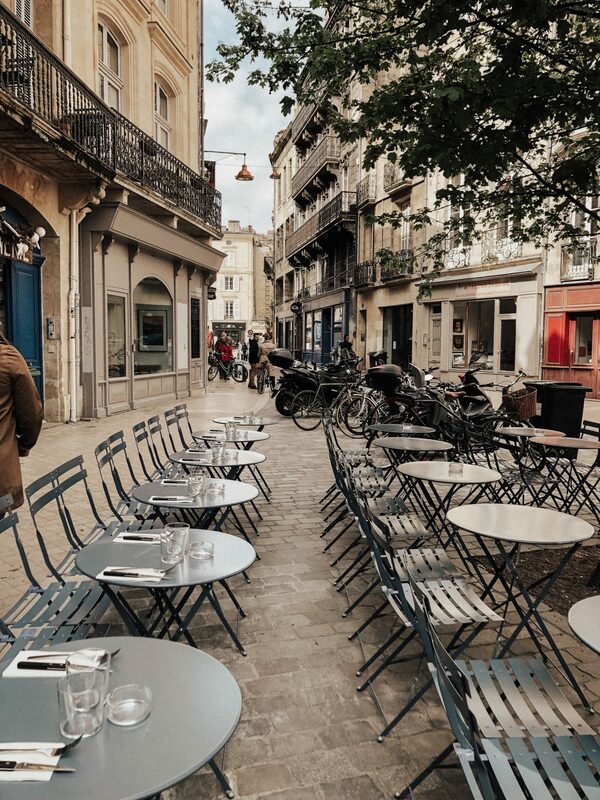 Le Marais is such a fun district because the food is incredible and everything feels very cool. I would say it definitely has a hipster vibe to it, which we were into. 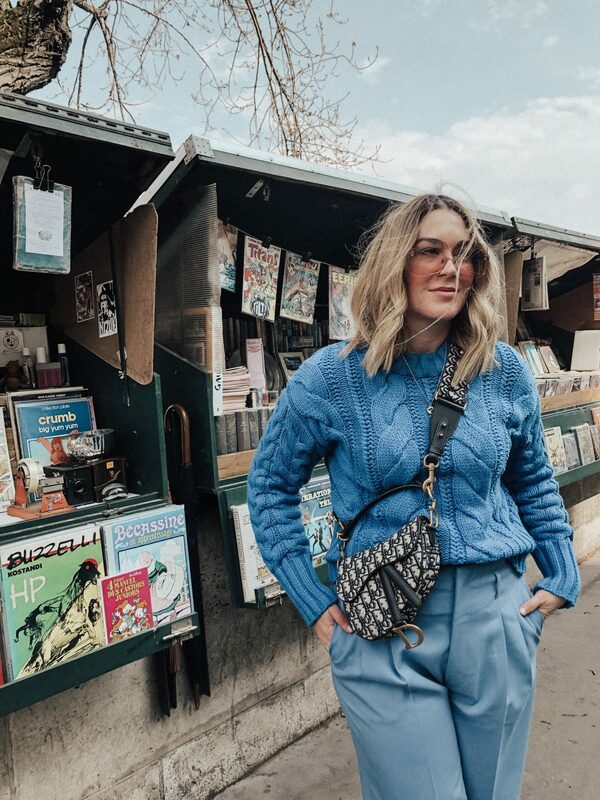 I highly recommend checking out this district while you are in Paris. Since I’m matcha obsessed and converted Ariana into a matcha lover as well, of course I researched all the places to go and get matcha. It’s not as popular in Paris yet (coffee rules all in Europe it seems) but you can find it at quite a few coffee shops throughout the city. 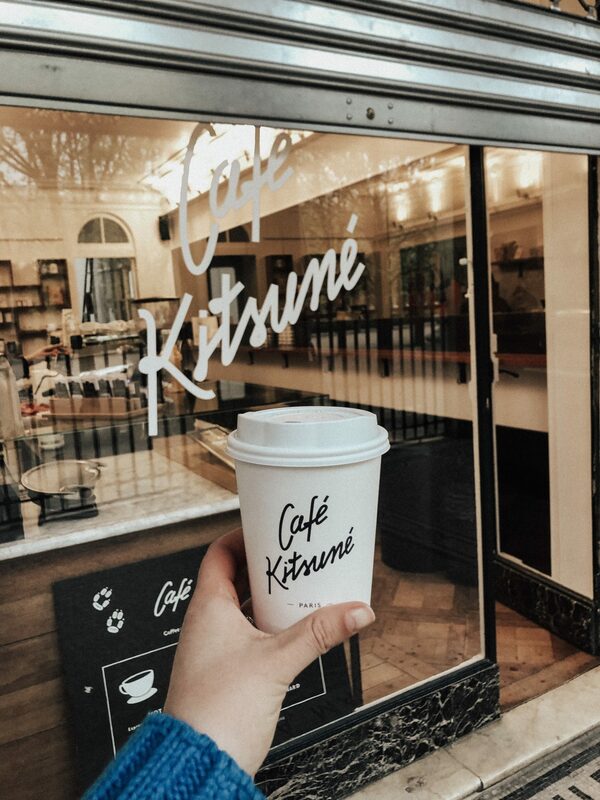 Our very favorite was Cafe Kitsune. The entire vibe was EVERYTHING and the matcha was amazing. They actually offer oat milk, which was EXTREMELY rare to find in Paris. We actually came back to Cafe Kitsune so much because this location was right near our hotel and they actually opened at 9:00 am, which was unheard of in Paris. I loved Cafe Kitsune so much I even bought one of their sweatshirts (all of their merch is SO cute). Checking out all the famous bookstands that line the Sienne river. So charming. Found the coolest art shop in Le Marais called Slow Gallerie. 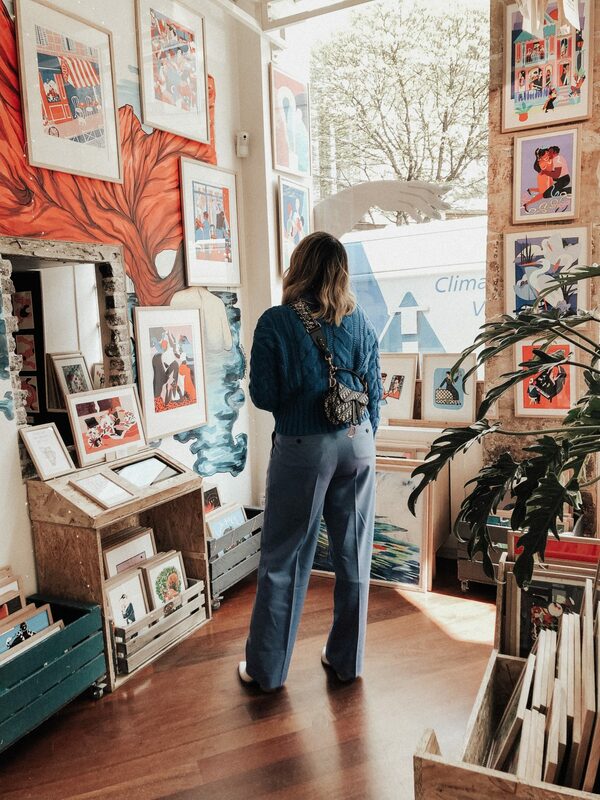 I loved every single piece of art and I am SUPER picky when it comes to prints. Wish I could’ve bought every single thing. Finally got crepes and had a stranger take a picture! 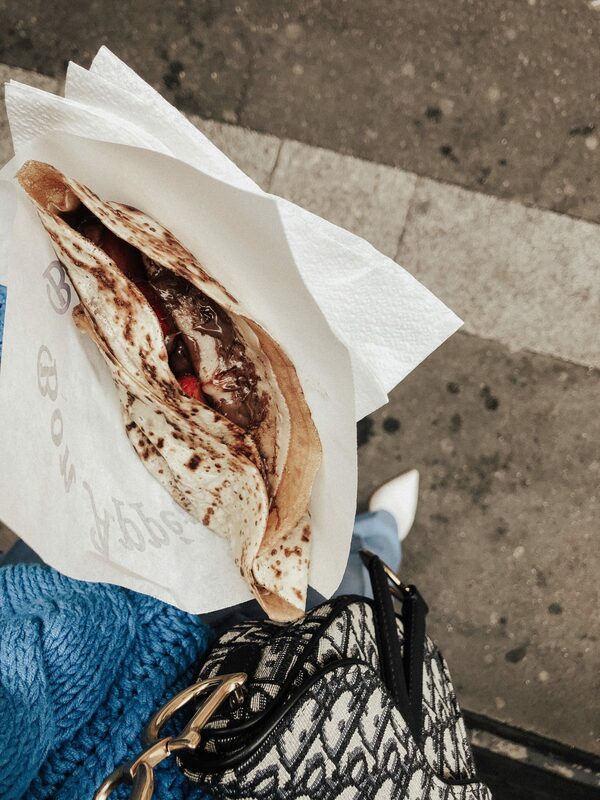 We found better crepes later on but did the job. We also went to the famous Angelina’s (they’re been around since 1903!!!) for their even more famous sipping chocolate. It was so incredible and surprisingly, not too sweet, which was perfect for me! I would say it lives up to the hype and it was a much needed break for our feet. Angelina’s has a treat and souvenir shop so if you’re looking for something to bring home, this a great stop for that. 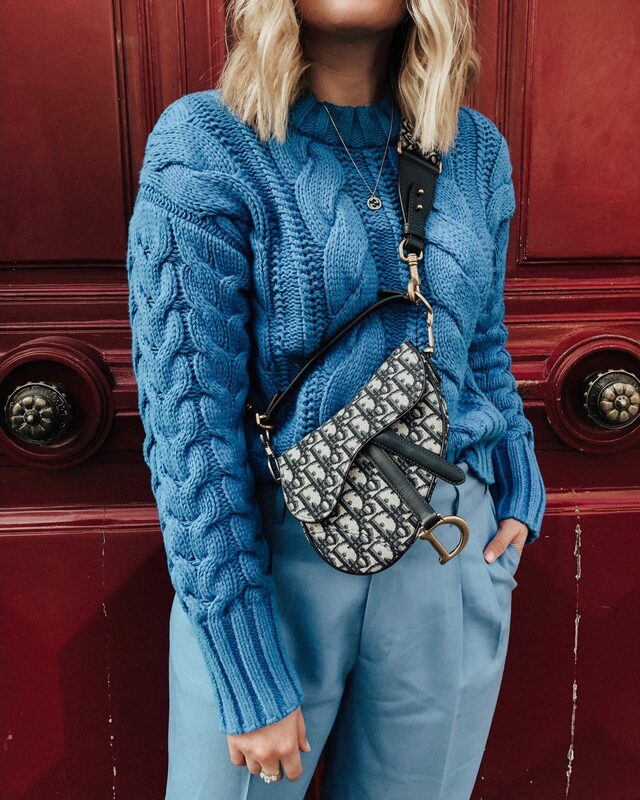 Clearly very excited to be wearing my new bag! 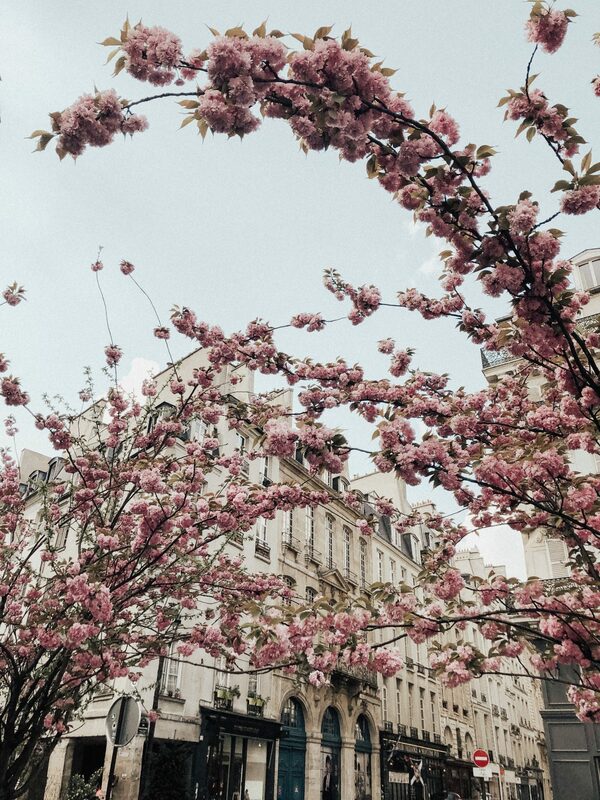 The entire city of Paris was in bloom and it was beyond magical! Can I just say how much I loved this outfit? 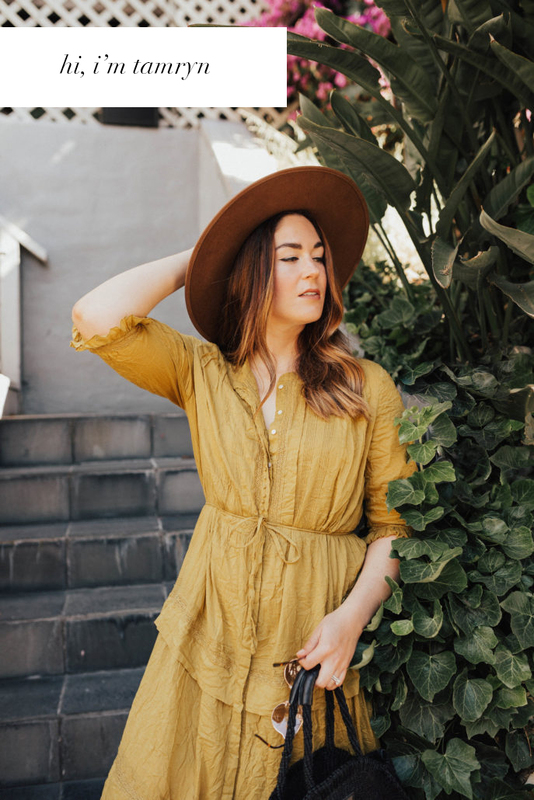 I added it at the last minute and was so glad I did because it ended up being my favorite outfit from the trip. Good ol’ H&M and Zara for the win! 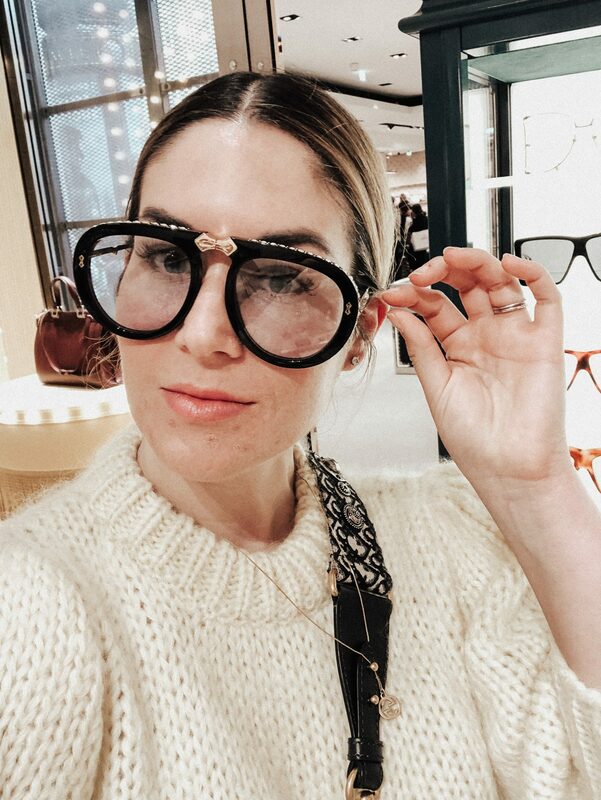 Stopped by & Other Stories, which was super fun because I love this shop! They are based in Paris so it felt very cool to see their home stores on this trip. 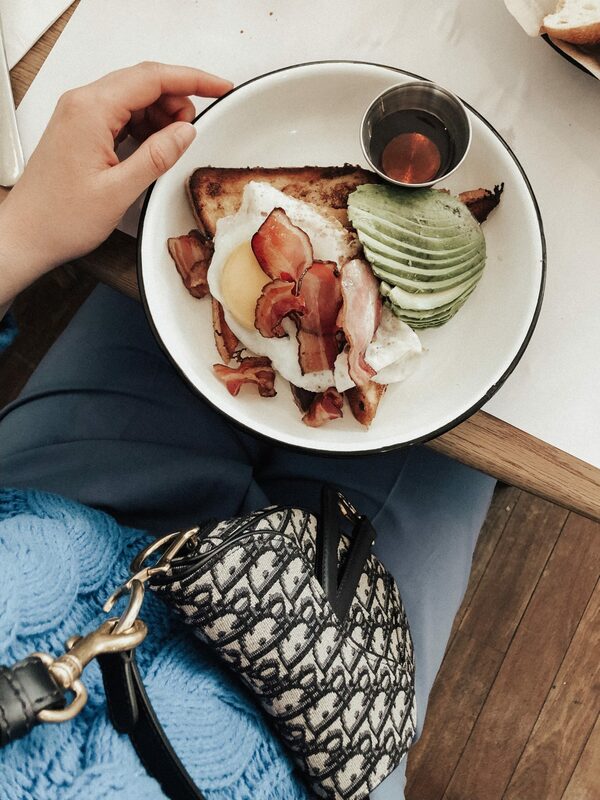 A very EXTRA breakfast at Hotel Saint Marc. 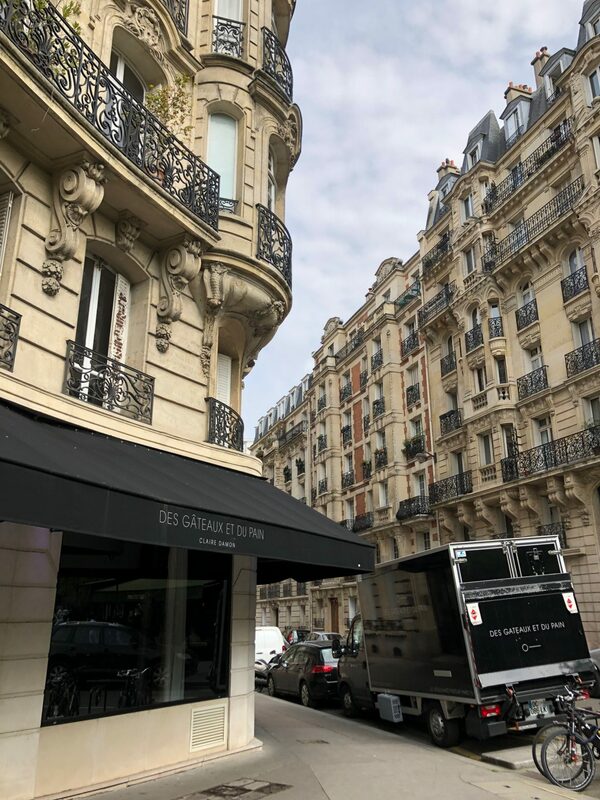 We had planned to go to Versailles and we were so lucky that our lovely Hotel Saint Marc served a lovely breakfast spread early because like I said, not a lot is open super early in Paris. 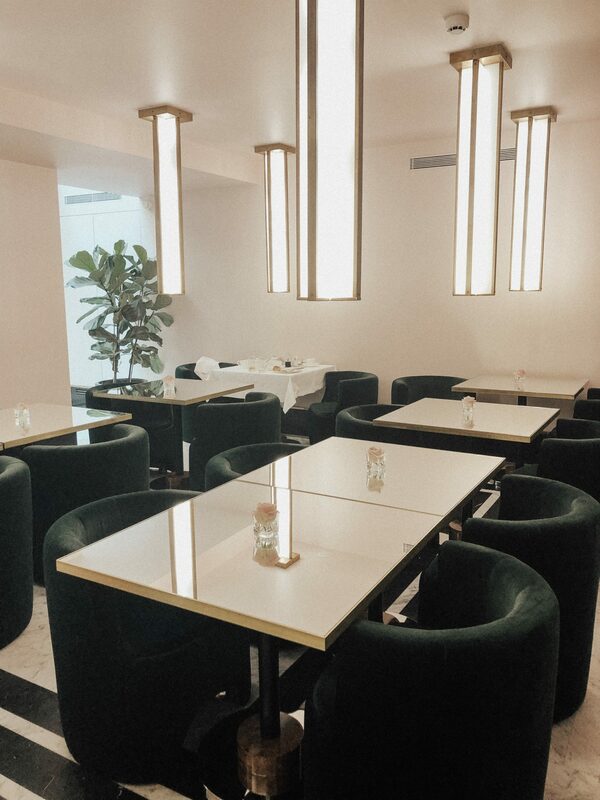 Of course, their breakfast room is very Instagrammable and perfect for a meal before you start your day. 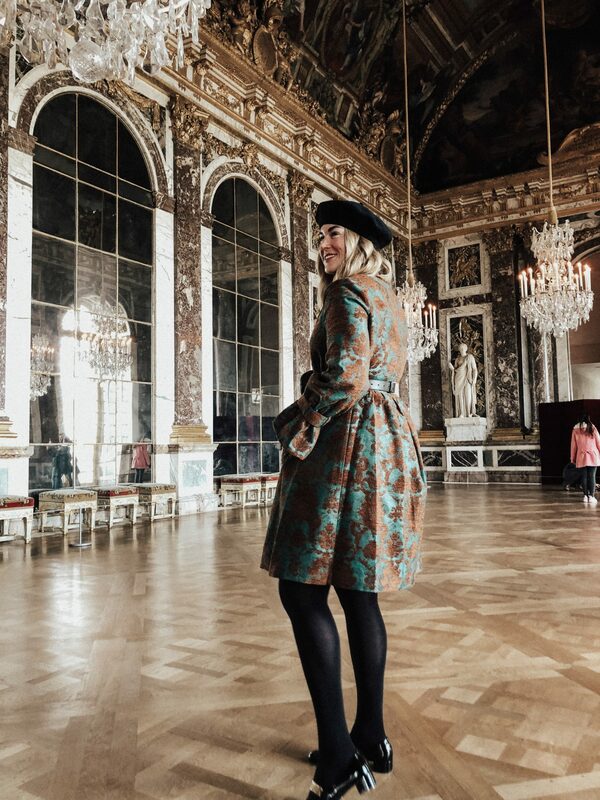 Because Versailles is allllllll about the glamor, I knew I needed to bring it outfit wise. 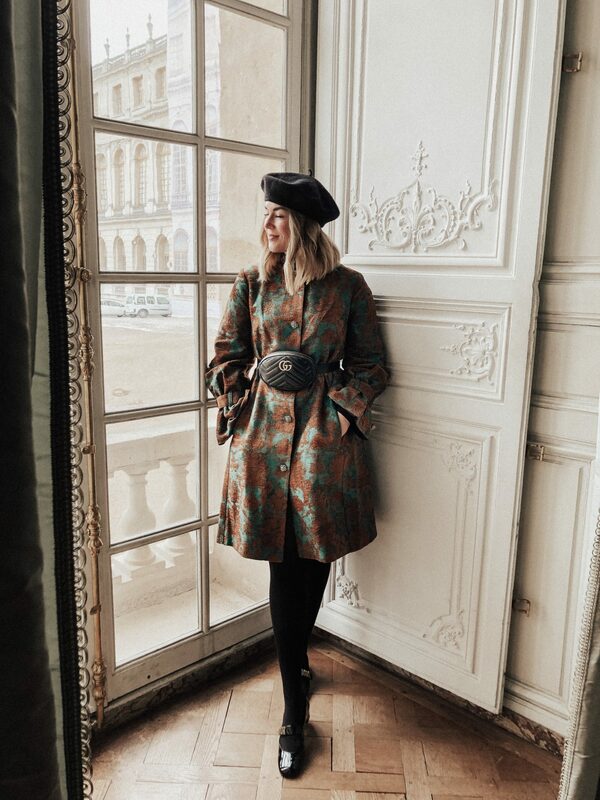 Luckily my friends at Sachin & Babi lent me this insanely gorgeous coat that I wore as a dress for the occasion (you can shop their collection and check out with code TM20 for 20% off your purchase!) and it was so perfect. Look ma! Barely any people! Let me tell you, getting to Versailles was a little stressful. Ariana bought our Versailles tickets ahead of time but we still needed to buy our train tickets because that was the easiest way to get to Versailles from Paris. We had to take two different trains, which seems not too hard, but when everything is in French and people are moving so quickly and you have no idea how ticketing works, it is STRESSFUL. We were both running around trying to figure it out (we were better on our way back) but I just get so anxious taking public transit in a different country. It ended up being fine, we got to Versailles in one piece and it was AMAZING to see it in person. Like, STUNNING. Everything is so ornate is the attention to detail was just beyond. I was stunned at how huge the grounds were. We got there at opening (9:00 am) it was so worth the early wake up call. There were people there but not a ton. 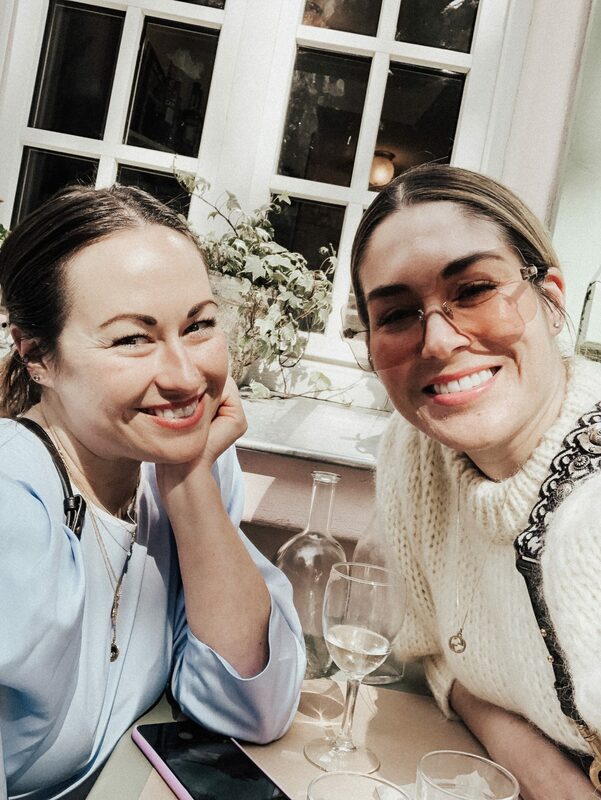 We could easily take photos with no one behind us (like I said, this is just the start before their super busy spring and summer seasons), so we really feel like we lucked out. 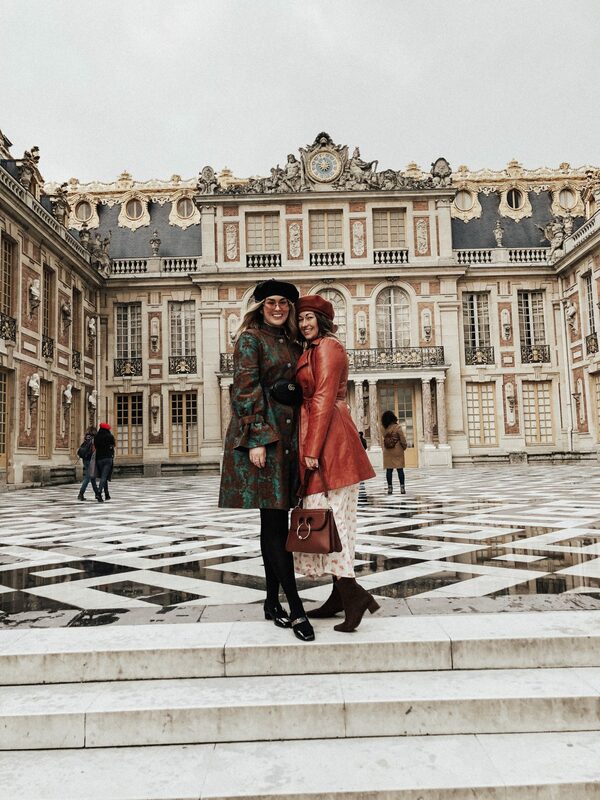 Highly recommend checking out Versailles. It’s more than worth the trip to get there! This gold gate is everything. Every detail is so exquisite. Of course I had to get a Hall of Mirrors shot! We got back to Paris around 1:00 pm since we spent the whole morning at Versailles, and decided to explore the Saint Germain neighborhood. 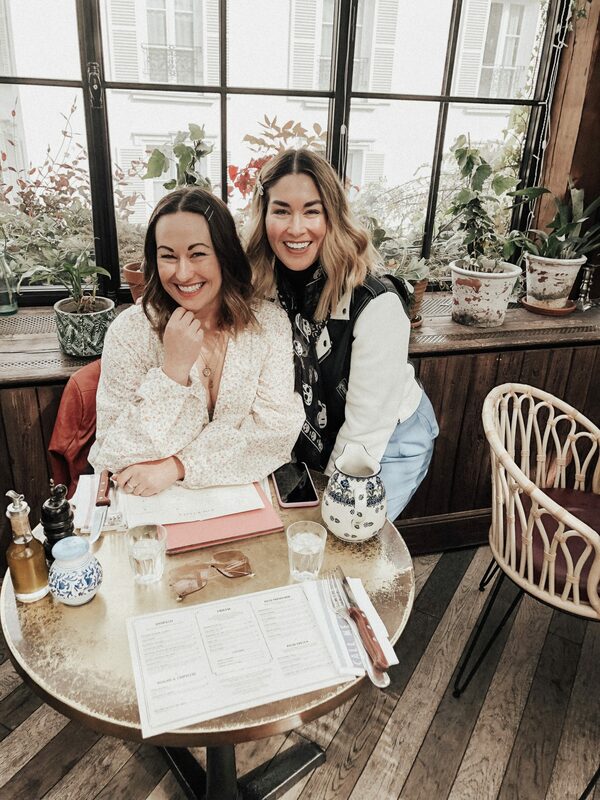 We finally got to check out Cafe du Flore, which is very popular and very Insta-worthy. I would say it’s worth the trek and the $ to just spend some time there and rest for a bit. The staff is super sweet and charismatic and I just love being able to sit with a pot of tea and relax after a ton of walking. 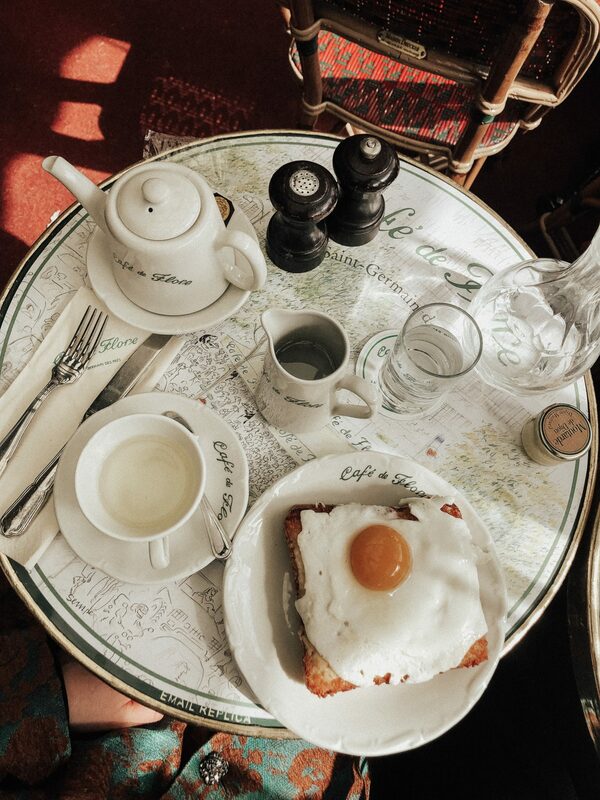 Cafe du Flore is so cute! 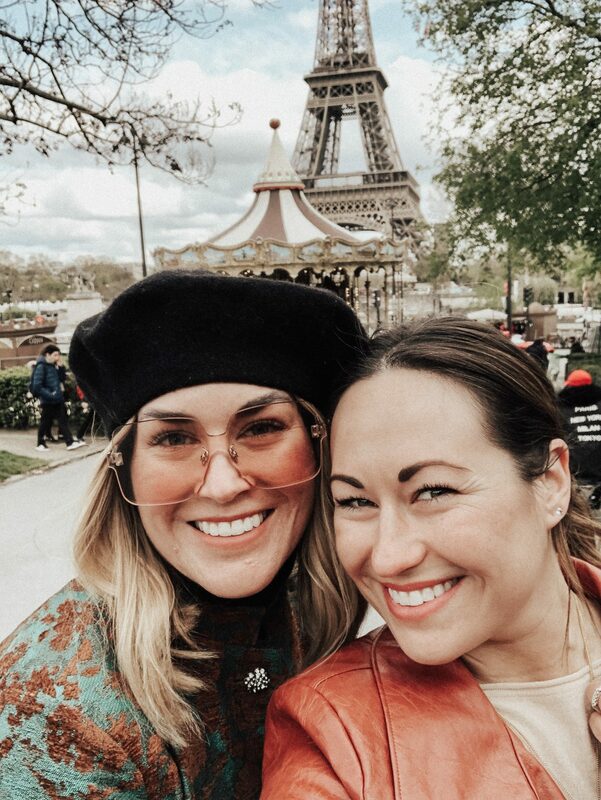 We then walked back to our friend, the Eiffel Tower and experienced the magic that is the beautiful Eiffel Tower carousel. It really is amazing and fun to see in person. We then made our way across the intersection so that we could check out a different view of the Eiffel Tower. I should’ve expected it, but there were sooooooo many guys selling cheap souvenirs around the Eiffel Tower and they are just so annoying. Literally coming up to you after you’ve said no like five times is just the worst, but whatever. It’s the biggest tourist attraction in Paris so I get that it’s just a part of what it is. Be prepared for tons of tourists here. Poor Ariana had to take like 200 photos to get a few like this. 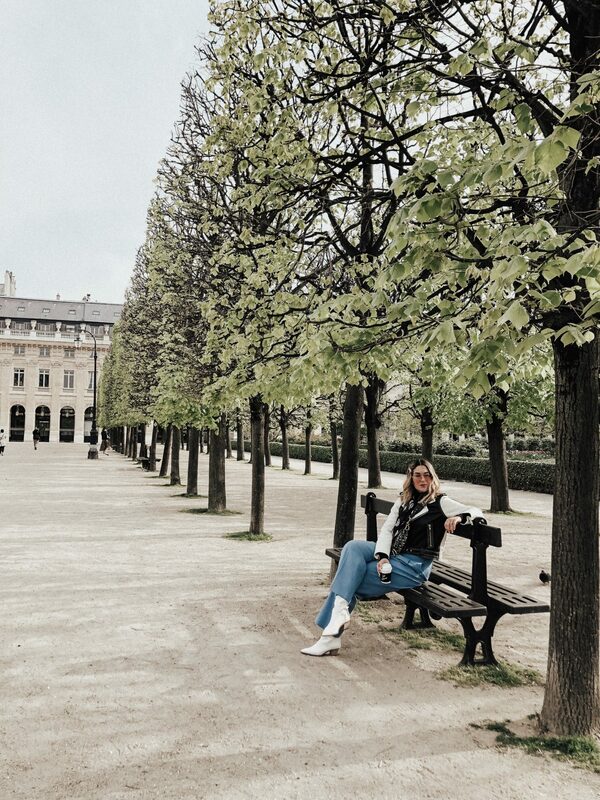 Didn’t Ariana capture the most PERFECT blooms and Eiffel Tower photo? DEAD. 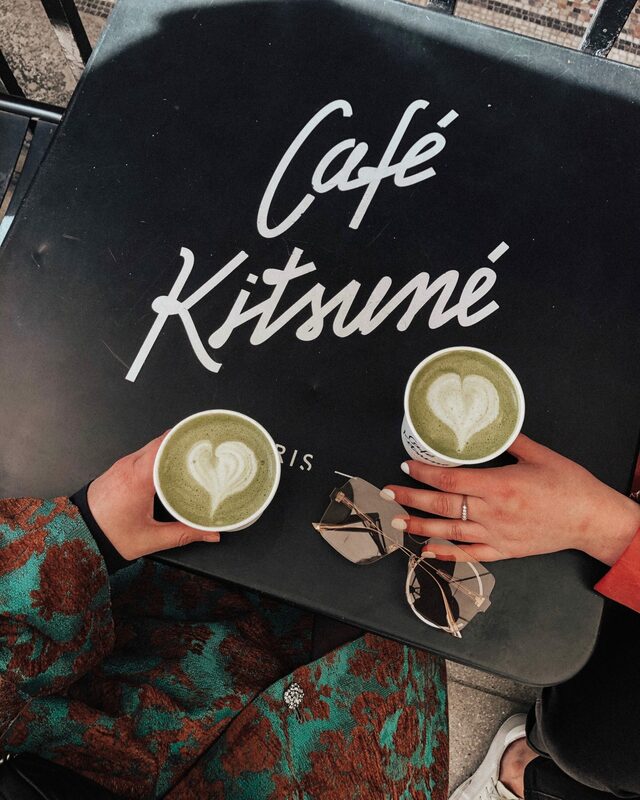 More Cafe Kitsune matcha pick me ups! 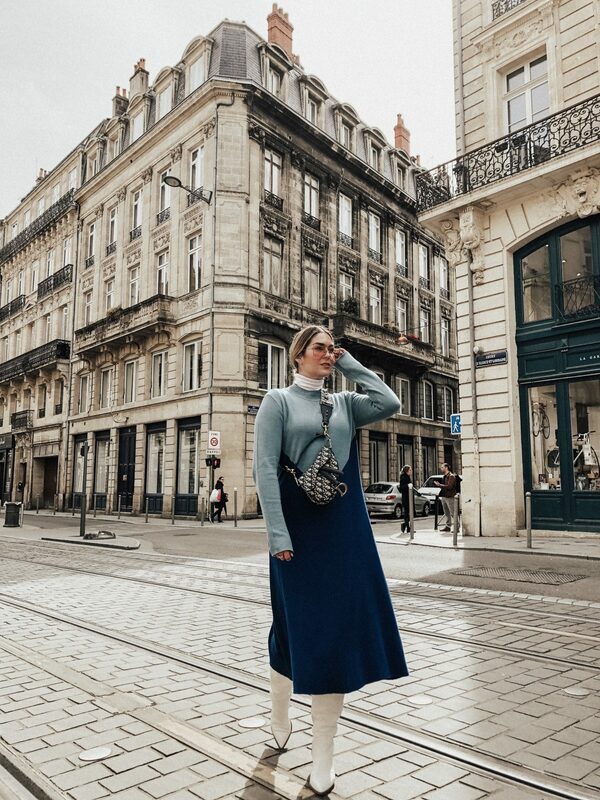 When we first started planning our trip, Ariana had a great idea to travel to Bordeaux, about a two hour train ride outside of Paris, so that we could see another city while we were there. 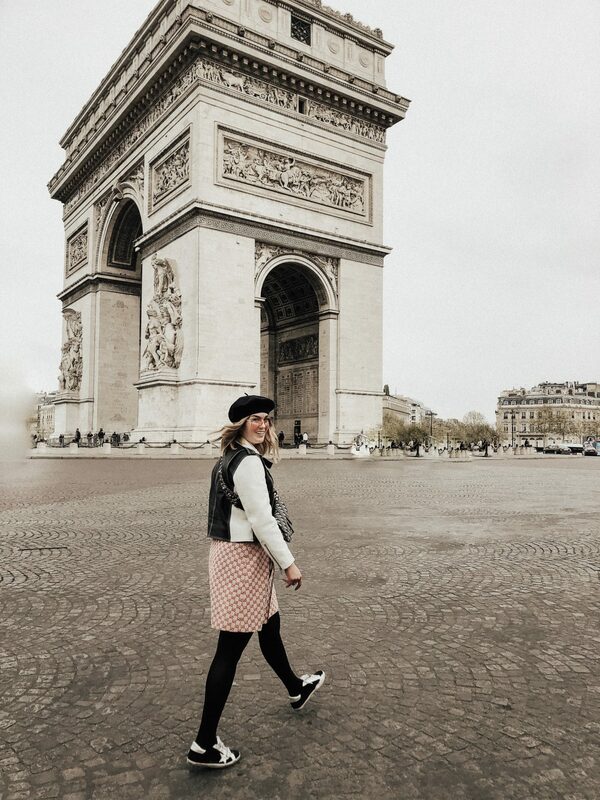 Even though I wasn’t sure I wanted to leave the city of Paris at first, I am so glad she suggested this because it ended up being a highlight of our trip to see this super cute and charming city. First of all, Bordeaux is not a quaint little French city. I mean, it is cute and charming, but it feels big and bustling, which I loved. Plus, we figured out pretty quickly that Bordeaux is a big foodie city, which meant that there was incredible food at every corner. 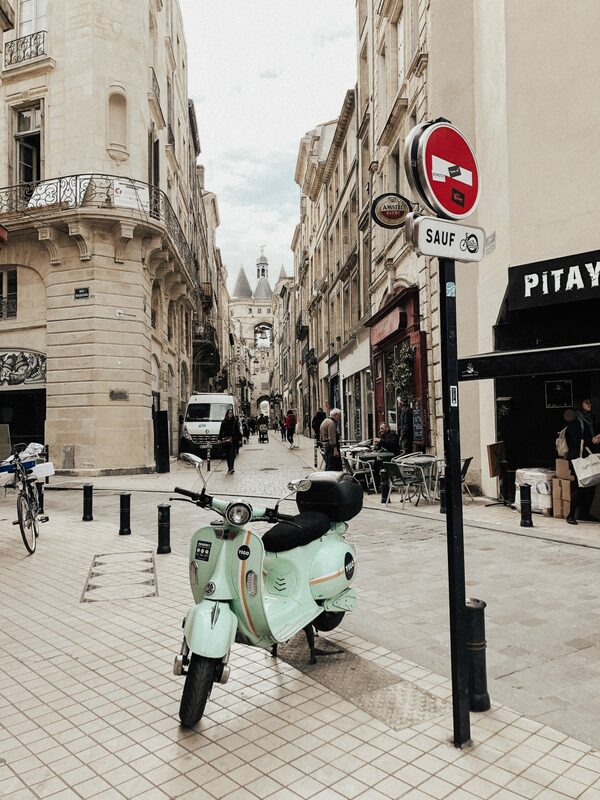 I also felt like the culture of Bordeaux was amazing. Everyone was so kind (not everyone spoke English as well as they did in Paris) and the food was out of this world. 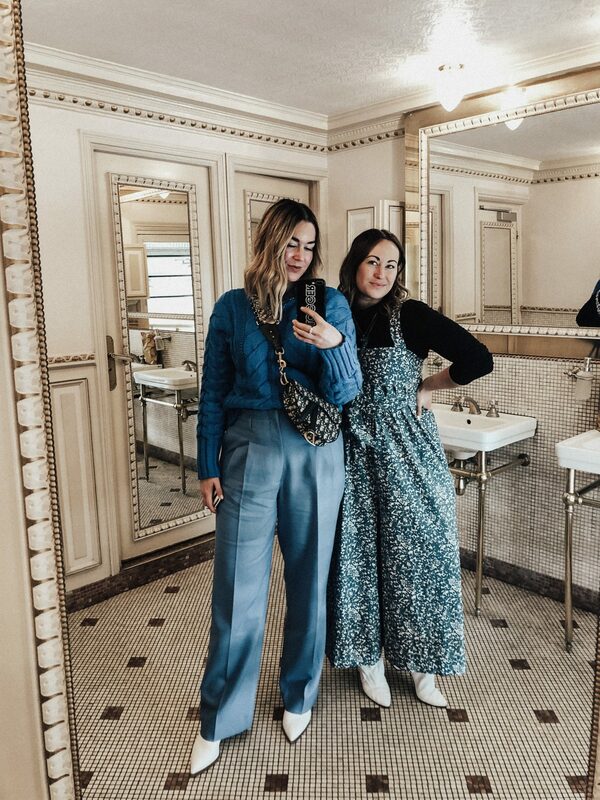 We just really enjoyed the overall vibe. It was so fun walking the streets and seeing the history of the city. 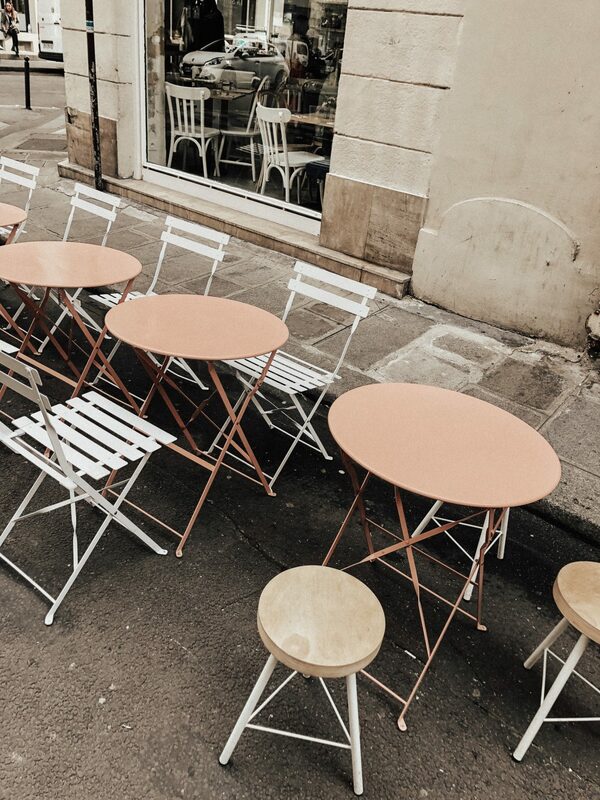 Two of my favorite food experiences in Bordeaux were eating at Contrast (a brunch place that Ariana found. Brunch is VERY popular in Bordeaux.) and discovering Bordeaux’s Asian food scene. I’ll start with Contrast. Wow. We were blown away by this experience. First of all, it’s very popular so I would get there early if you want to get a table. 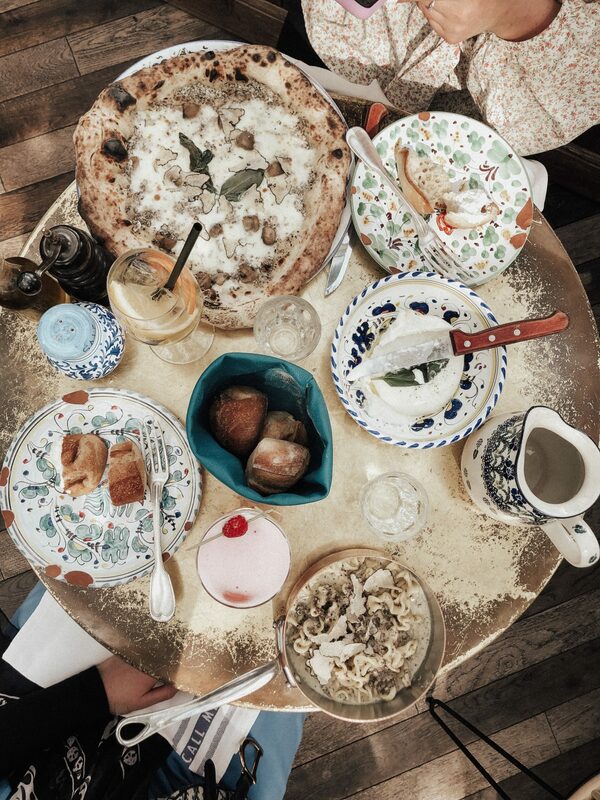 Also, it’s very Instagrammable so I felt right at home snapping pictures of all our food. At Contrast, one of their menu options is to try all of Contrast’s favorites (their mini pancakes, smoothie bowl, two avocado toasts, fresh juice, and a hot drink) for like 20 Euro. It was INCREDIBLE. We were licking everything clean because it tasted so fresh and delicious. We were hoping to make it back to Contrast before our train the next day but literally nothing opens before like 10:30 am (WHAT?!) so we were only able to enjoy it that one glorious time. Definitely a food highlight from the entire trip. We also ate Ramen in Bordeaux (of course I can’t remember the name now) and it was the best Ramen I ever had. 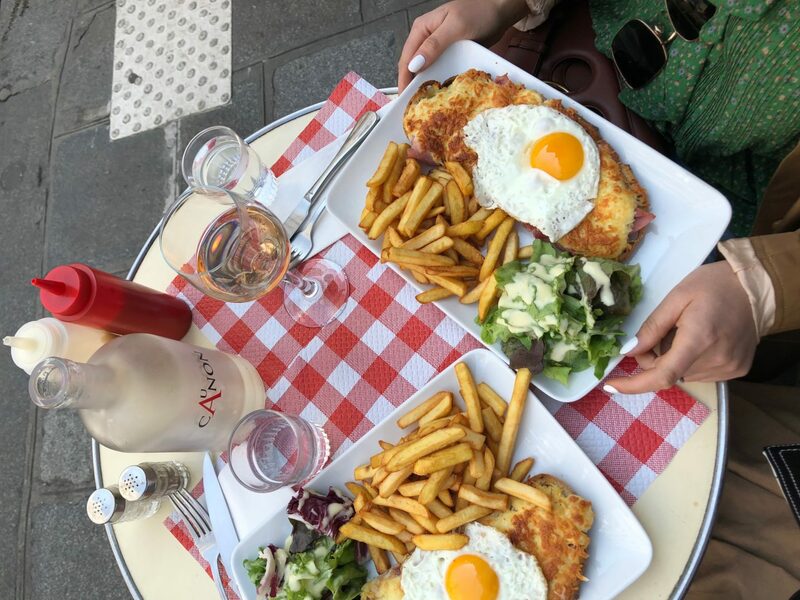 The food in Bordeaux is so fresh and delicious and the more people we talked to about Bordeaux in Paris, the more we learned that Bordeaux is known for their incredible food. We stayed in an Airbnb in Bordeaux and it was great. It was very centrally located and our host was so kind and considerate (this was the listing). You can see Bordeaux’s famous clocktower! Every street is beautiful and cute. Don’t worry, Bordeaux has great French doors that rival Paris. Contrast, please open a restaurant in SF. PLEASE. 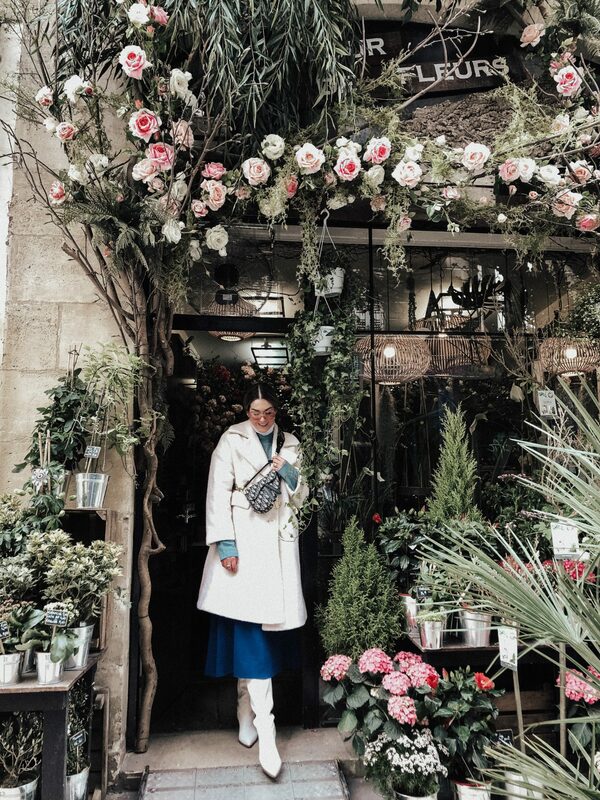 Loved this charming flower shop and the owner was so sweet to let us take photos. Very charming and historic streets with VERY modern train systems running throughout. So funny. Clearly, monochrome looks were my thing on this trip. We left Bordeaux and hopping on our two hour train ride back to Paris. 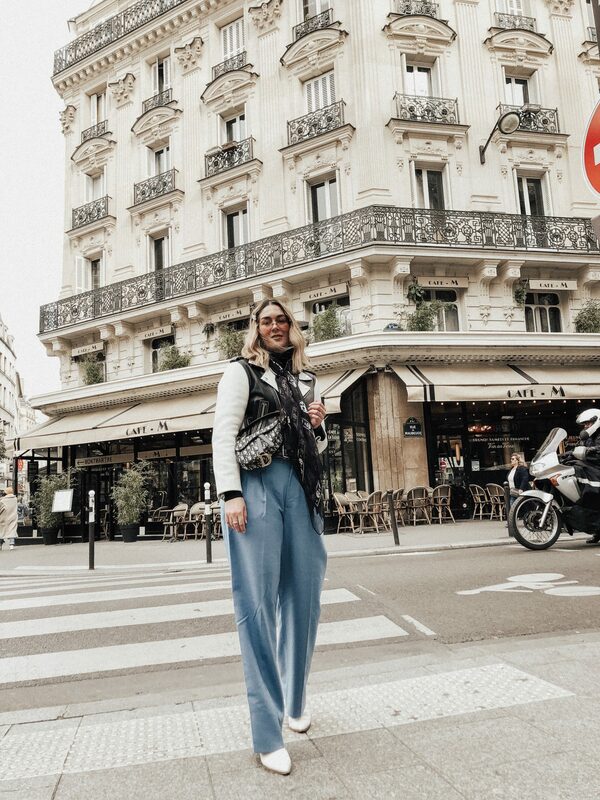 I had to admit, I was excited to get back to Paris and to our beloved Hotel Saint Marc. We both were! This was the most spring like day we had on our trip. It was warm enough that I didn’t need a coat and it felt glorious. We walked all around and explored Montmarte, which is such a cute Paris district. We tried to go to Pink Mamma because that was the Paris restaurant we were most excited about going to but it was so popular that they weren’t taking anyone else without a reservation. BOO. 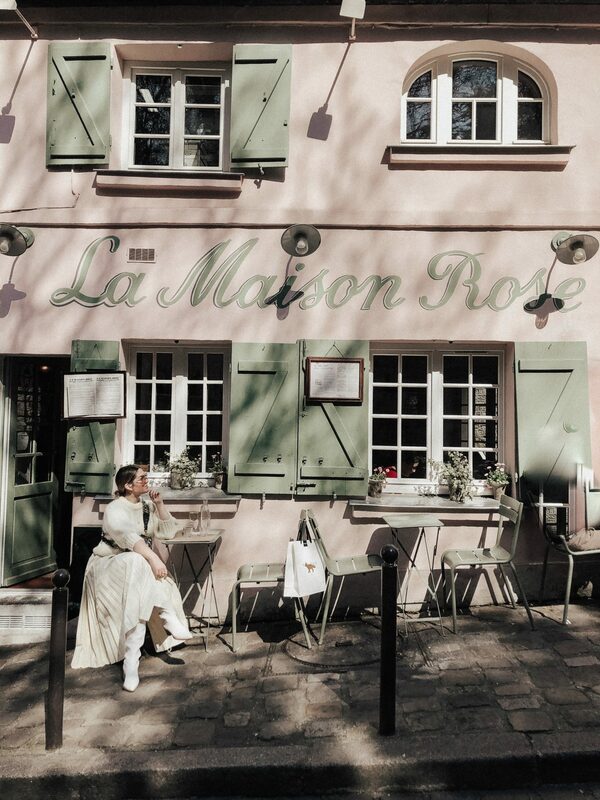 But, that did leave room for us to finally head up (and I mean UP) and see the famous La Maison Rose, which is just as cute and adorable as it looks in everyone’s Instagram photos. It truly is a hike to get up there and we were sweating by the time we made it to the top. We ended up eating here and the food was surprisingly good for bring such a tourist magnet. The staff were so sweet and they even blocked people from taking photos in front of our table because they have a photo policy about not letting people take photos in front of their restaurant without permission. I’m guessing this means like professional photo shoots but if I were you, I would just hike up to this must see spot and eat lunch there because it’s so good. After we were done, we went and saw the famous Moulin Rouge, which is really just famous to me because of the movie Moulin Rouge! Guilty! It was neat to see it in person but the district that it’s in is nothing to write home about. In fact, it’s pretty seedy and underwhelming so we continued back down checking out all the other cuter streets. Ariana bought her special Paris souvenir, Gucci loafers, and it was fun to see her so excited (she loves them). 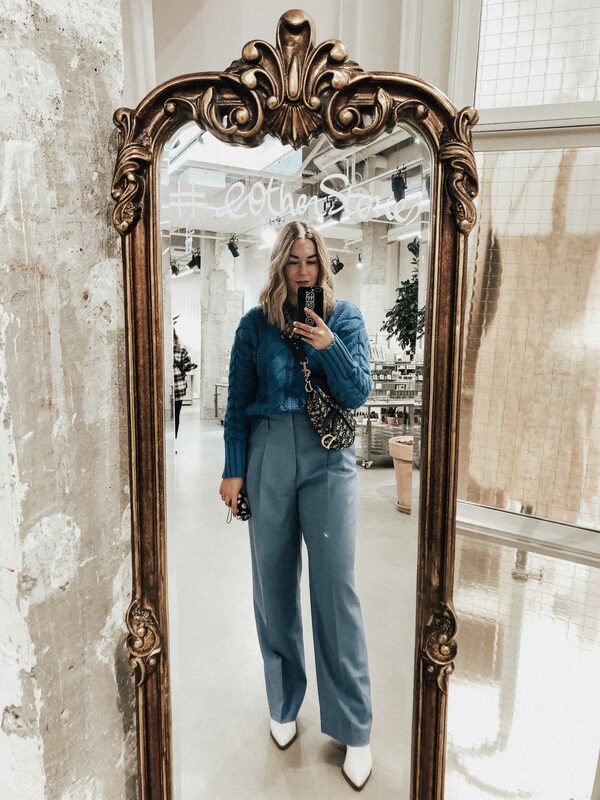 We also went to Sezane (we had been to the one in New York but Suzan is based in Paris so it was fun to see it’s home), ate street crepes, I bought a Cafe Kitsune sweatshirt, and I tried brown sugar boba for the first time, which was incredible. 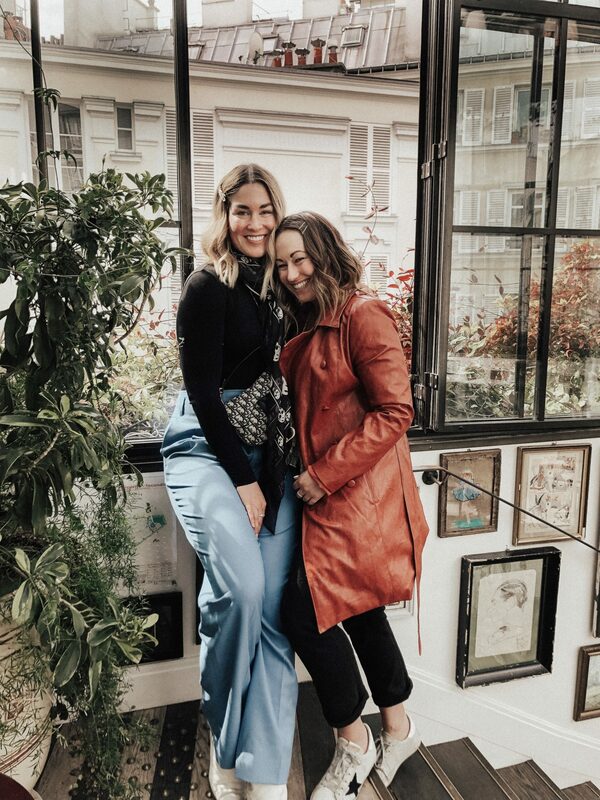 All in all, we felt so great to be back in Paris. A magical tourist free moment. Just as beautiful as I always imagined it. Really wanted to take this Gucci chair home with me. Brown sugar boba is HEAVEN in a cup. 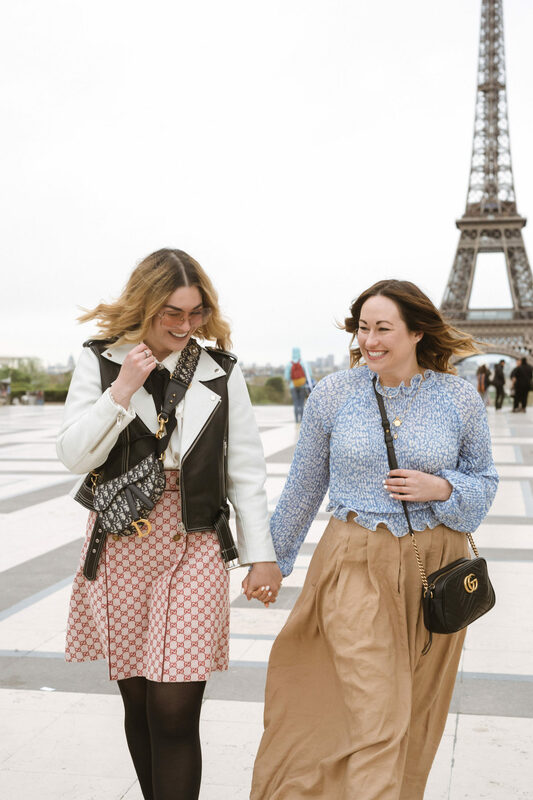 We had a bright and early wake up call to shoot with Paris photographer, Anastasia, to get that early morning magical Eiffel Tower moment at Trocadero. 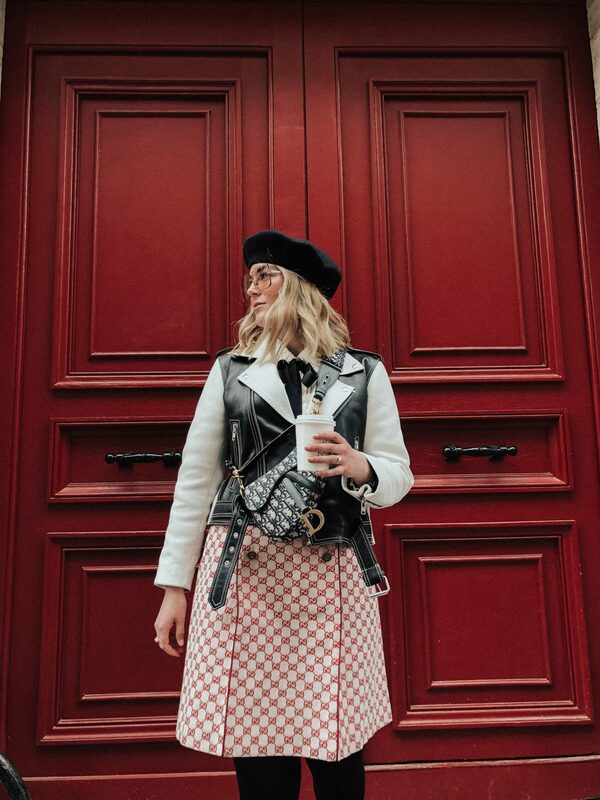 Still lots of people around but I would absolutely recommend hiring Anastasia to shoot your special Paris moments. I will be sharing more of these professional photos in separate blog posts soon! After the shoot, Ariana and I went back to the hotel and dropped off all our stuff. I changed into sneaks and off we went. We walked all around and finally saw the Arc du Triomph and Champs de Elysses, which was really neat. Honestly, I can take or leave Champs de Elysses as it’s VERY touristy and I preferred shopping on Rue Honore much more. 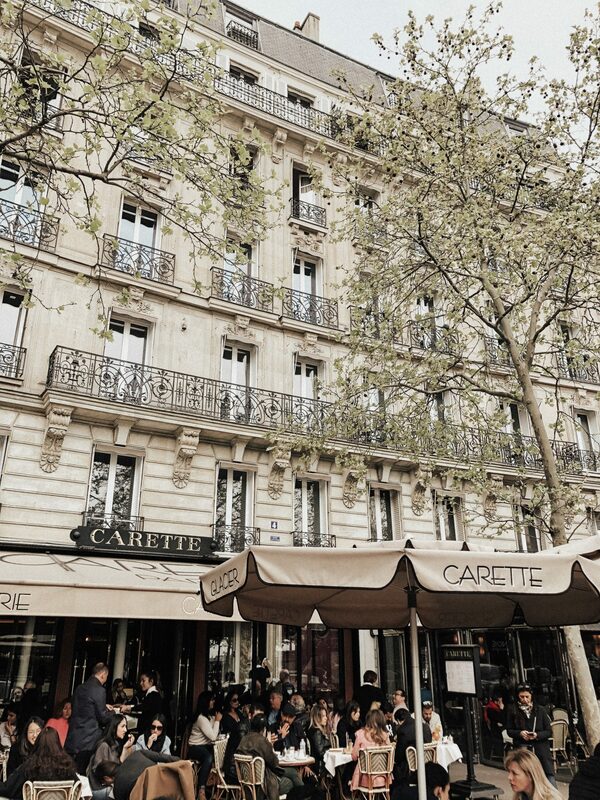 We ate lunch at Carette, which is a super cute spot across from Trocadero. It was super cute and really good, another great spot to people watch and rest your feet. We also FINALLY hunted down the best croissants in Paris from Des Gateaux et du Pain and they were phenomenal. We actually took an Uber there because at this point in the trip, our feet were really tired, and Uber was a great and easy way to get around the city when we needed a break. 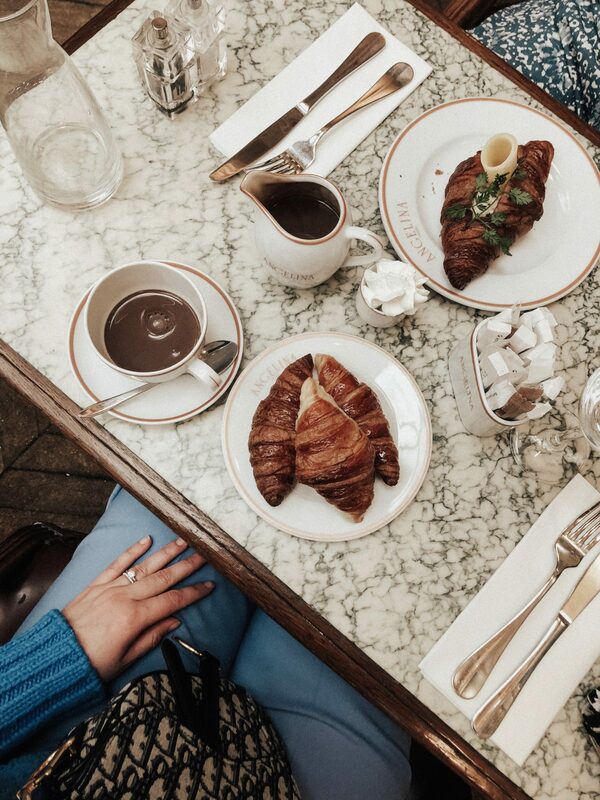 WELL WORTH THE UBER TRIP because omg, these croissants were to die for. 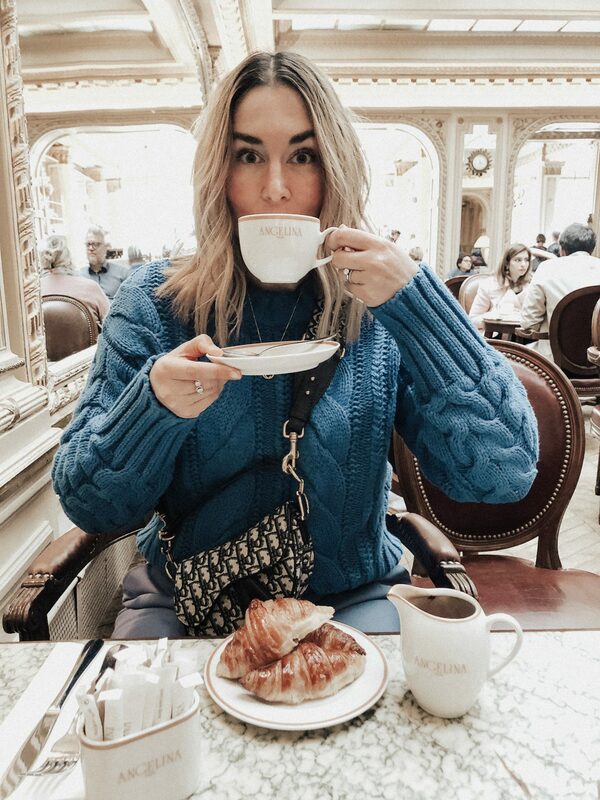 We were honestly so excited by how amazing this place was that we ordered croissants, rosemary bread, lemon tarts, chocolate cookies, and apple filled turnovers. Literally everything was to die for. Highly recommend this place for croissants iif you are in Paris. We also stopped by the original Chanel (Coco Chanel lived right above it) and it was so beautiful. It was very cool to be walking through such elite fashion history even though we didn’t buy anything. I was tempted, though. I’m convinced it was the best time of year to see Paris. Not crazy with tourists! So happy I finally got to wear my Gucci skirt from Jeffrey! 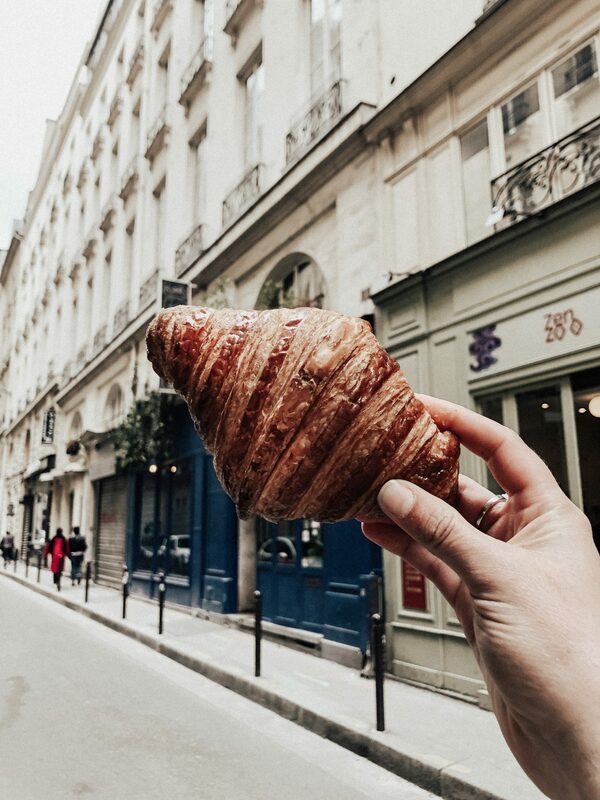 If you go to Paris, get a croissant from Des Gateaux ed du Pain. BEST. 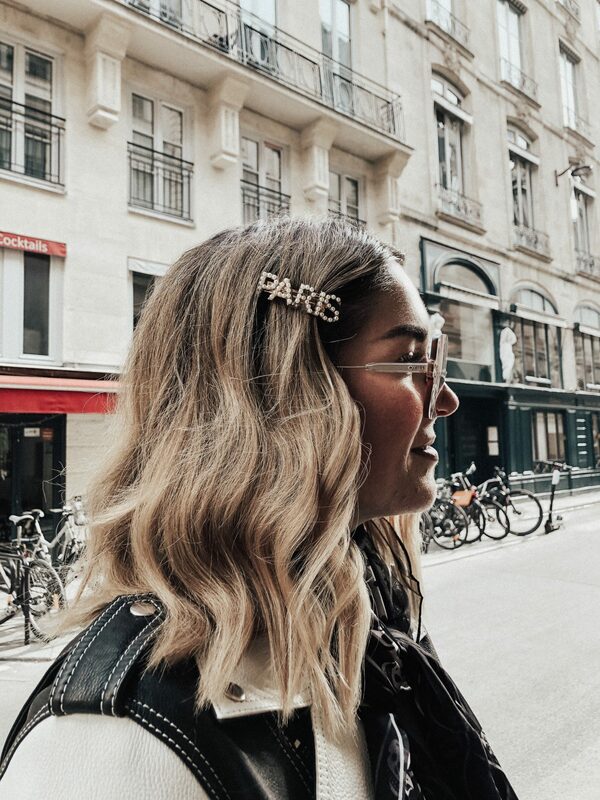 Wearing a fun Paris clip that Sarah gave me! I honestly couldn’t believe how quickly this trip flew by. It must be that were were literally out from morning until evening every day just seeing everything we could, which is exactly how we wanted it to be. 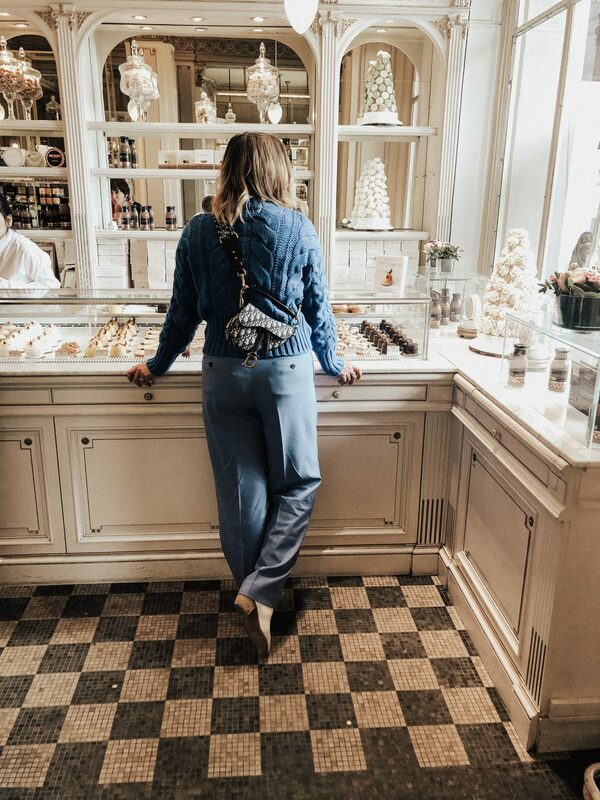 On the last day, we took one last stroll to our beloved Cafe Kitsune and took in the sites of Palais Royale one last time. 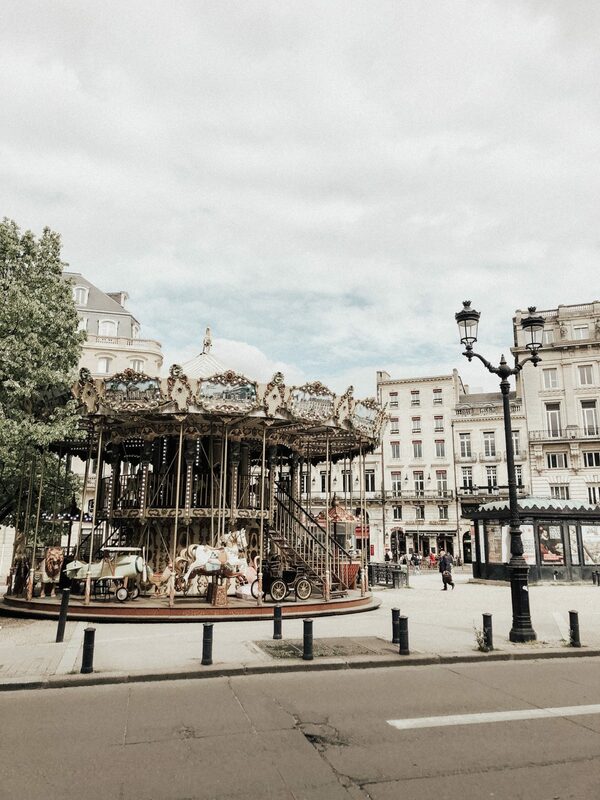 Paris is so magical that it really feels like you are walking in a movie. Once we were done at Cafe Kitsune, we made our last hike up to Pink Mamma to try and get it. We were told by a friend that if we showed up to Pink Mamma at least a half our before they opened (they open at noon for lunch), we would be able to get a table. We were both anxious about this because we wanted to go so badly but we were determined. We were the first ones there (we got there at 11:10 am) and at first, we were both like, wait, it’s a Monday. No one is going to show up. Five minutes later, a line started to form behind us and by 11:45 the line was wrapped around the building. Our persistence paid off because we were the first in the building and the first to be seated on the fourth story green house. Pink Mamma is so special because it’s a four story pink (duh!) 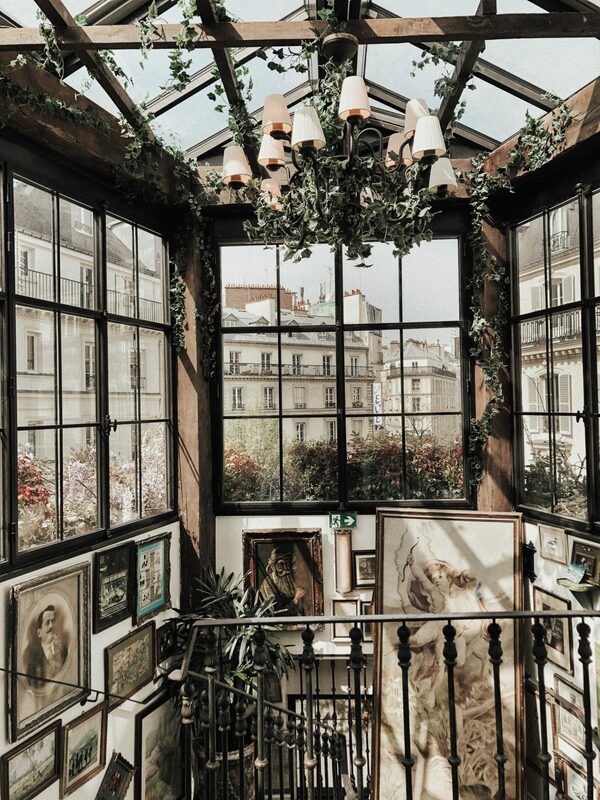 building in Montmarte and the staff and ambiance is to die for. We got all the uninterrupted photos we wanted and it was glorious. 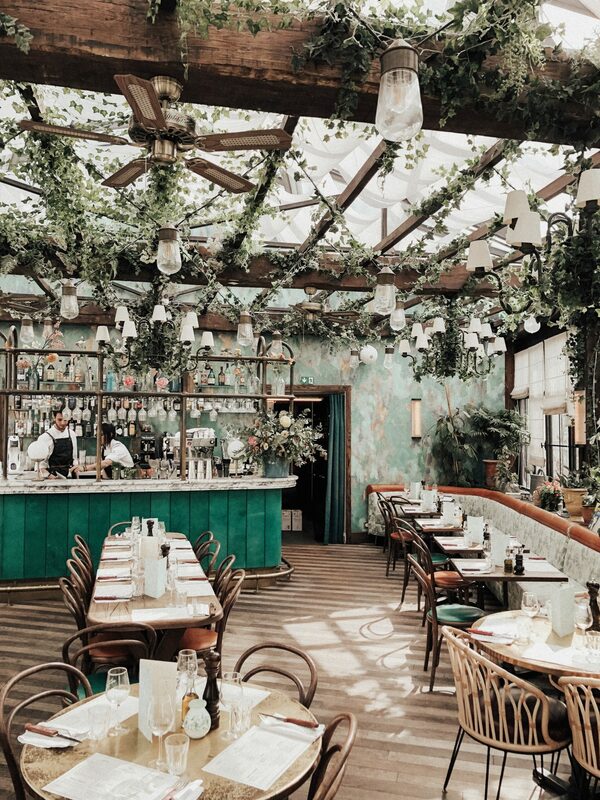 Beyond just the ambiance, the food is outstanding. I had truffle pasta and Ariana had truffle pizza and they were divine. We shared burrata and cheers with two signature cocktails that were incredible. 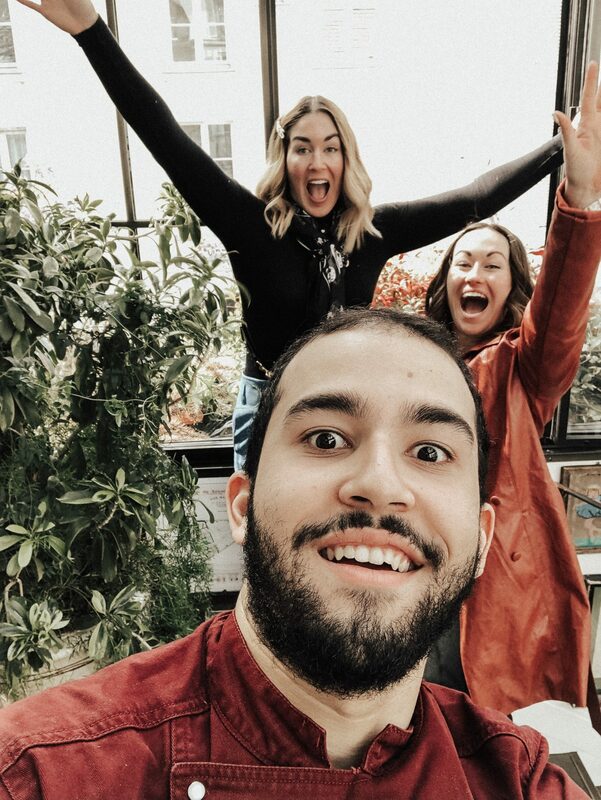 Our server, Dylan, was incredible and took so many pictures of us and also brought us Limoncello shots at the end to commemorate the end of our Paris trip. We left feeling so happy and alive and the feeling really stayed with us for the entire day. Such a fun meal for our last day! We ended up going back to Angelina for a final goodbye (their sipping chocolate is THAT good) and just walked along the streets soaking it all up. 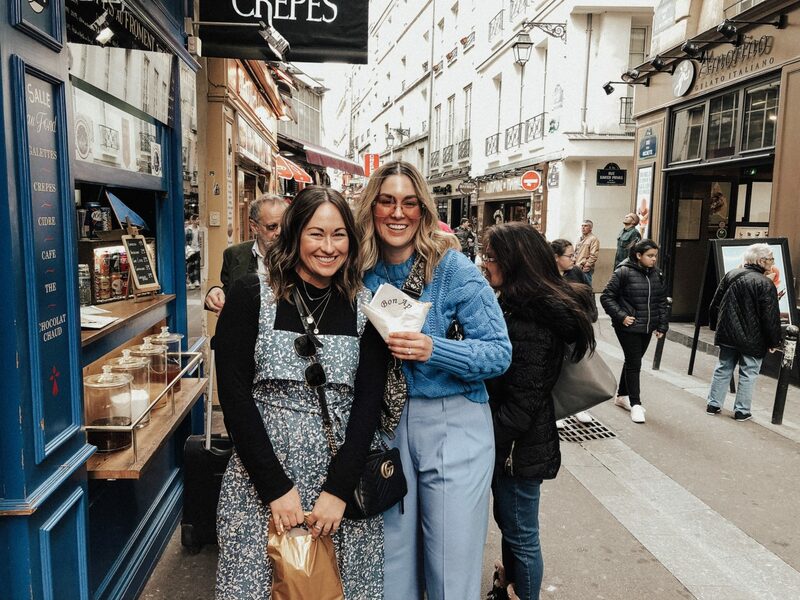 We went back to Pierre Here (the best macarons in Paris, trust us), got one more brown sugar boba, walked the streets, and got a street crepe for dinner. We saved the sparkling Eiffel Tower for the last night (we watched from just below the Trocadero) and I am so glad we did. It made it even that more magical and really was the best way to end our trip. It only sparkles for five minutes at the top of every hour so make sure you get there in time to see it sparkle! Overall, what an incredibly special trip to experience with my sister! Really soaking up the magic of Paris. 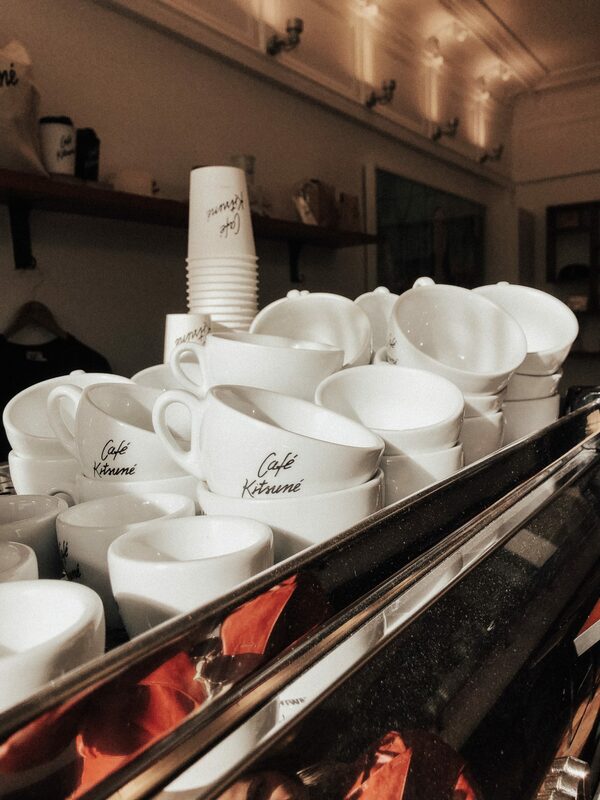 Cafe Kitsune in all it’s morning light glory. I swear, every street corner is straight up MAGIC. I’ll take all of these pink tables for my patio, please and thank you! Could Pink Mamma be any more gorgeous? Even the lighting is perfect at Pink Mamma. The staircase we walked up to get to the fourth (and best!) 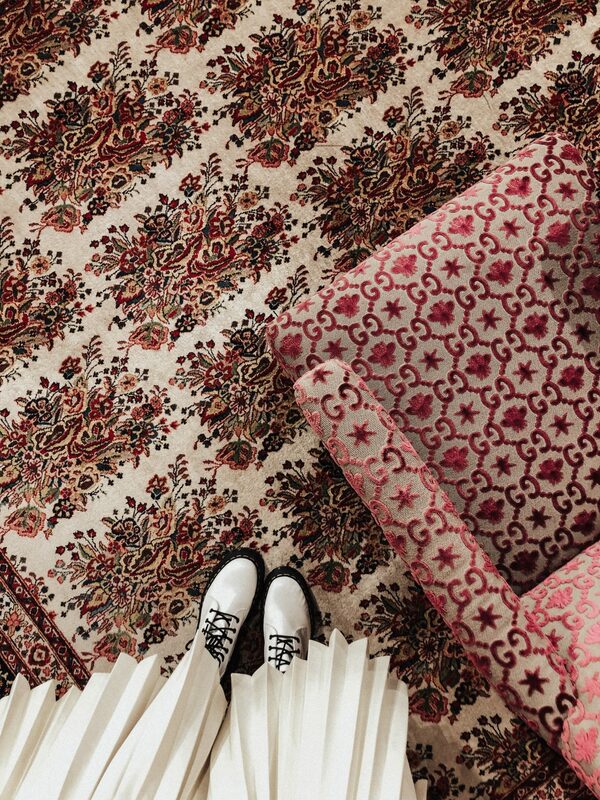 floor! THE VIEW FROM THE TOP OF PINK MAMMA. An amazing tourist free photo of the front of Angelina. We went to the one on Rue de Rivoli both times and loved it. Hotel Saint Marc has a beautiful garden patio. 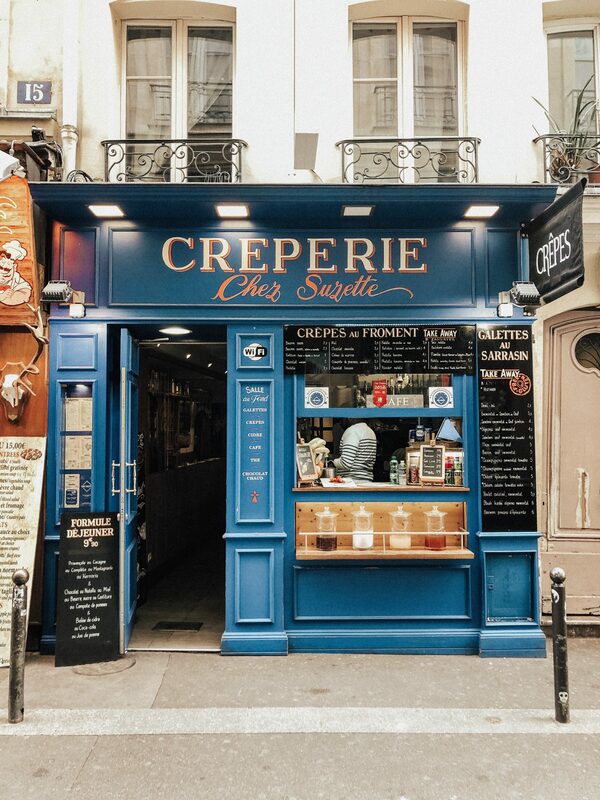 The place we got street crepes from. SO GOOD. Our last night at the Eiffel Tower waiting for it to sparkle! A lot of people always talk about how rude French people are and I did not find this to be the case AT ALL. Everyone was so kind and accommodating everywhere we went. People approached us asking if we needed help or tried to help point us in the right direction if we asked a question. I also never once felt at risk for pick pocketing, which we were also warned about. I mean, you’re in a huge city. Just be aware. I cannot stress this enough. The good restaurants require reservations. There were so many times where we couldn’t get into the places we wanted because we didn’t have a reservation, which was disappointing. In SF, you can often get in anywhere without a reservation if you get there early enough but in Paris, diner doesn’t usually start until after 7:00 pm (late for us) and lunch hours are usually limited (most lunch places serve until around 2:30pm and then reopen for dinner later). Make sure you are looking at opening times everywhere you want to eat. It will save you time! We were averaging between 10-14 miles per day, which meant that our feet were tired all the time. Luckily, you’re in Paris and their are cafes everywhere to pop into, get a tea or coffee and rest your feet/people watch. Also, make this your bathroom stop because…. …you have to pay to use public bathrooms here, which I hated. As someone who has to pee constantly, this is my hell. However, we managed ways around this by stopping into Starbucks (the only free public bathrooms), hotels, and utilizing our cafe breaks. Make sure you have Euro on you just in case! 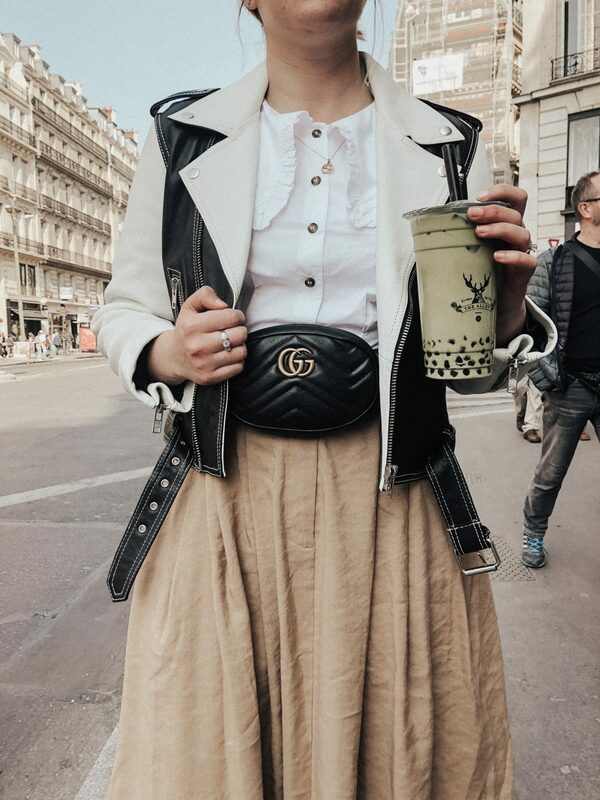 I knew that buying designer was going to be awesome in Paris, one of the shopping capitols of the world, but they make it so easy for foreigners to buy what you want tax free. They will give all the papers you need and at the airport, you just scan those papers and you get the tax credited right back to your credit card or via cash. Even the airports have easy to right signs that point you exactly where you need to go. So nice but also hard not to buy everything. Also, someone told me that I needed to perfectly wrap my designer items that I bought so that they didn’t look used to get my tax refund. That is not the case at all. No one even looks and/or questions your purchases. Seriously, people in Paris do not get up early because nothing is open. We got to Versailles at opening and it was SO worth it. You will have everything to yourself. Most people in Paris speak English but it’s much more respectful to greet those around in French by at least saying hello and thank you. Trust me, it goes a long way. 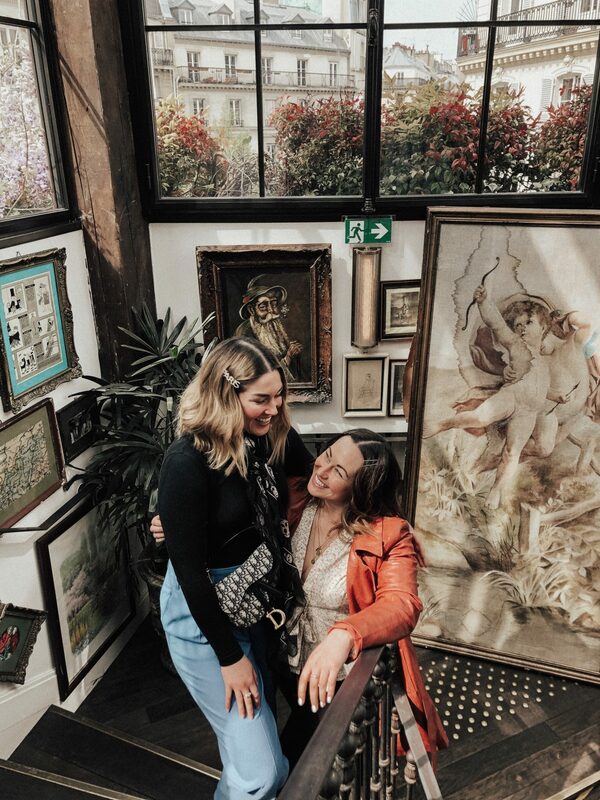 I hope you enjoyed this very long Paris Sister Trip Guide! It was truly one of the best trips I have ever experienced and I cannot wait to go back. Au Revoir!